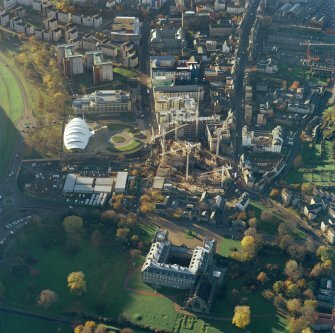 For nearly one hundred years, photographs from Scotland's skies have captured every aspect of a rapidly changing nation. 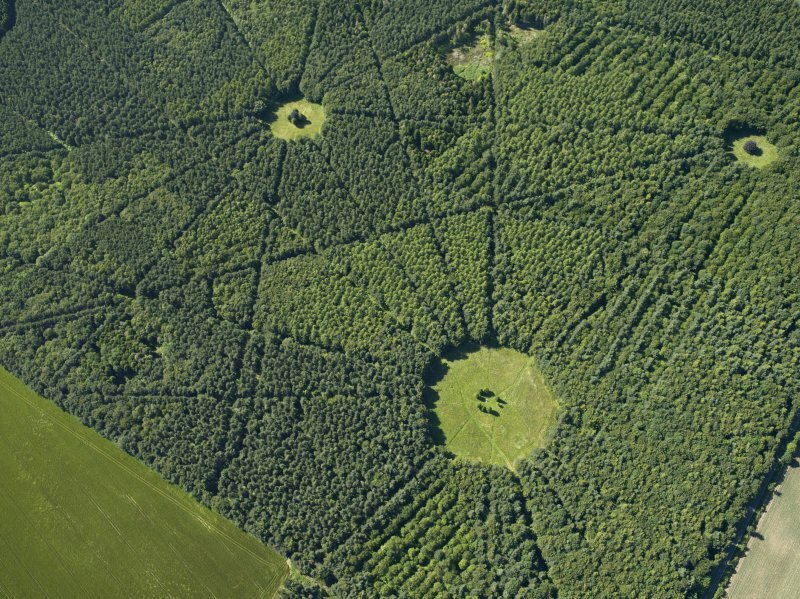 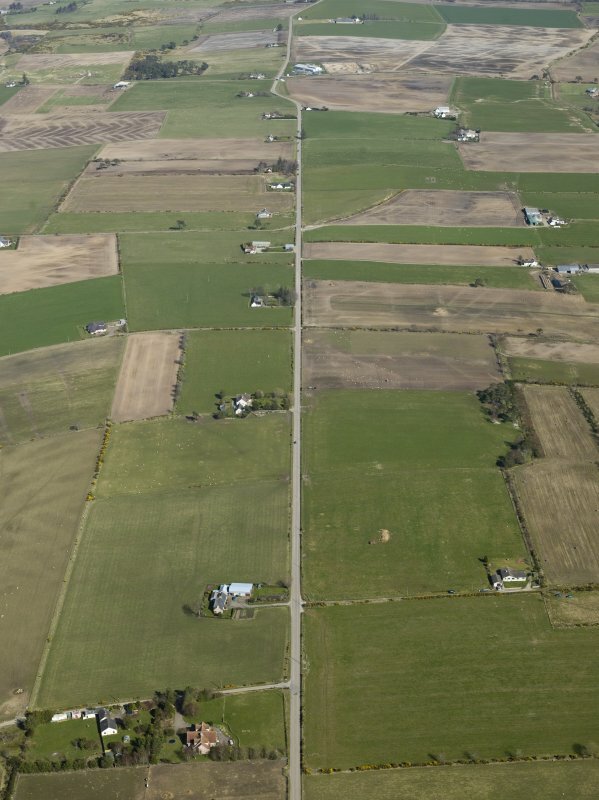 The National Collection of Aerial Photography is made up of millions of these images, unique split-second pictures of history stopped still. 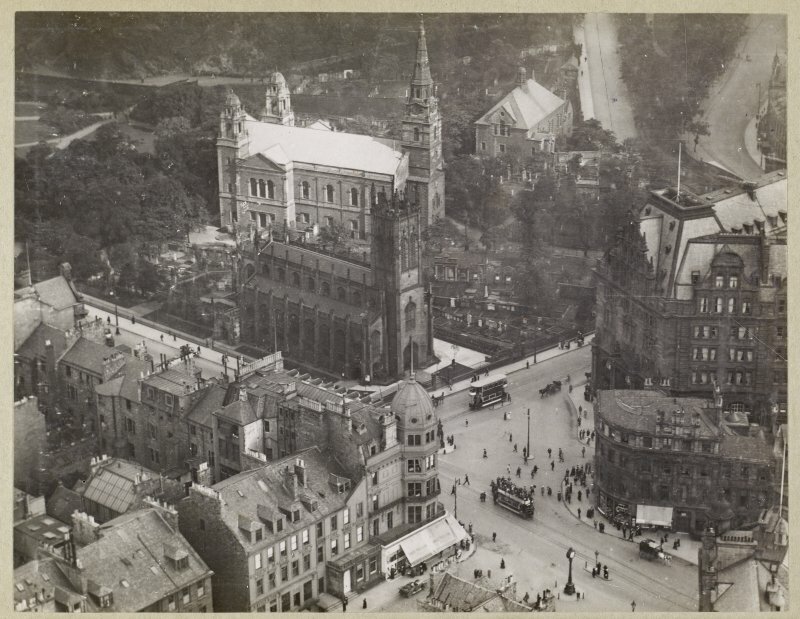 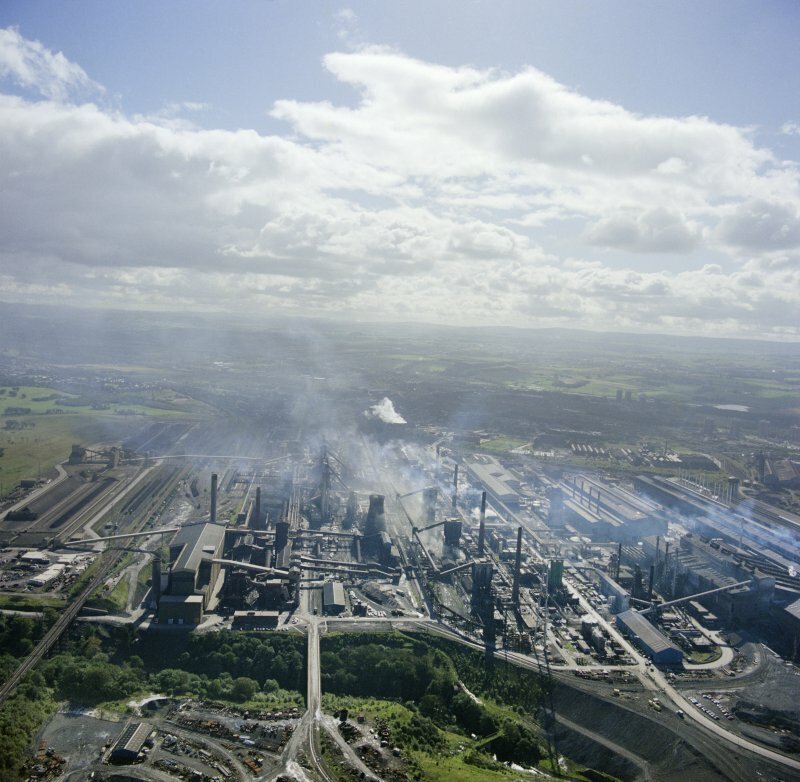 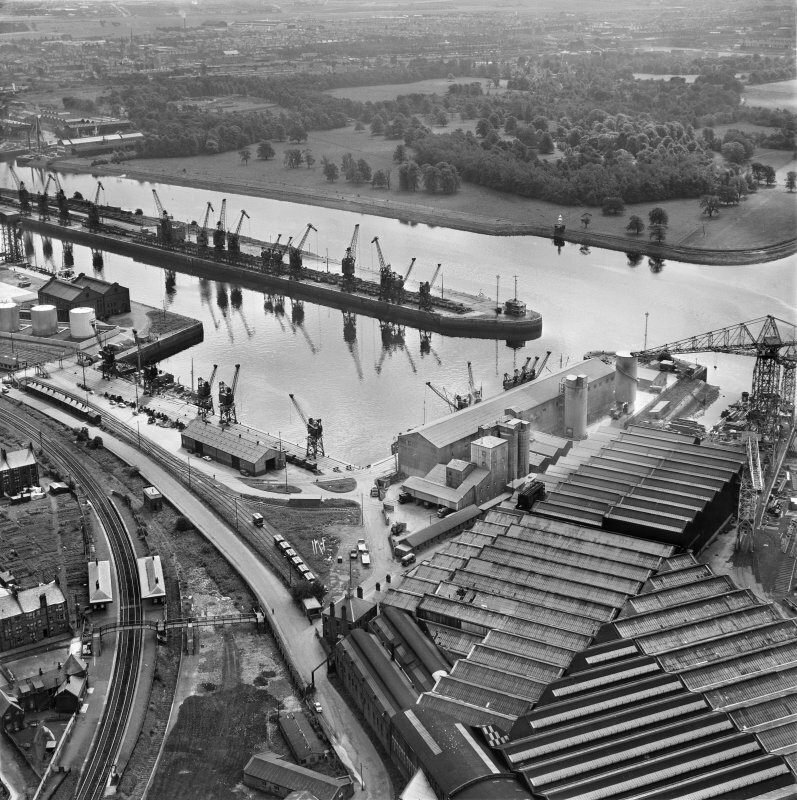 The earliest aerial views in the Collection – from the years immediately after the First World War – bring to life the towns and cities of our grandparents, with horizons obscured by chimney smoke and vast factories and shipyards powering the British Empire. From the 1940s, thousands of Royal Air Force photographs witness the nation transformed into a military machine, its countryside and coastlines bearing the heavy boot-print of global conflict. And images from the second half of the twentieth century show the dramatic decline of the Central Belt's heavy industries, and the diverse new communities, from utopian New Town experiments to huge glass and chrome retail outlets, which have risen to take their place. 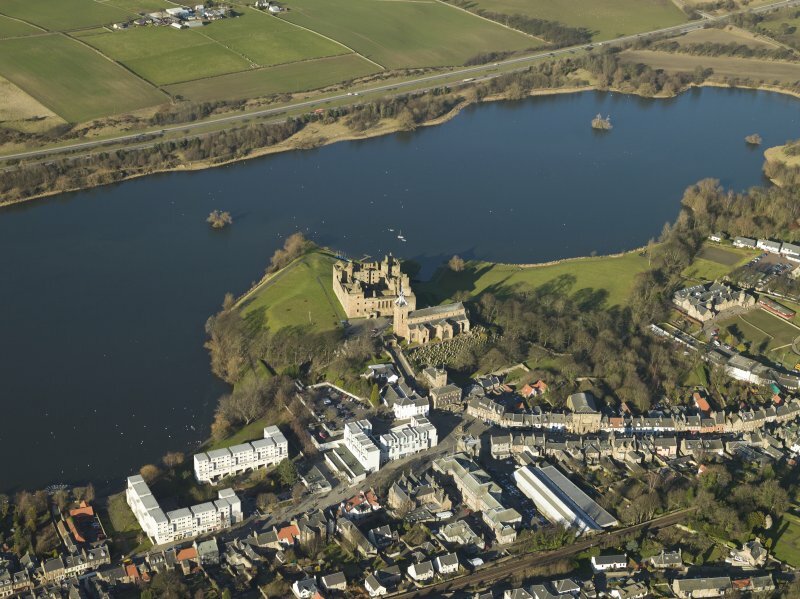 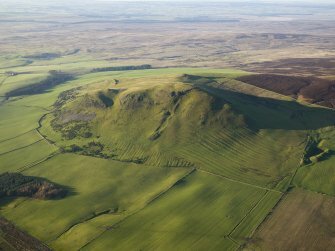 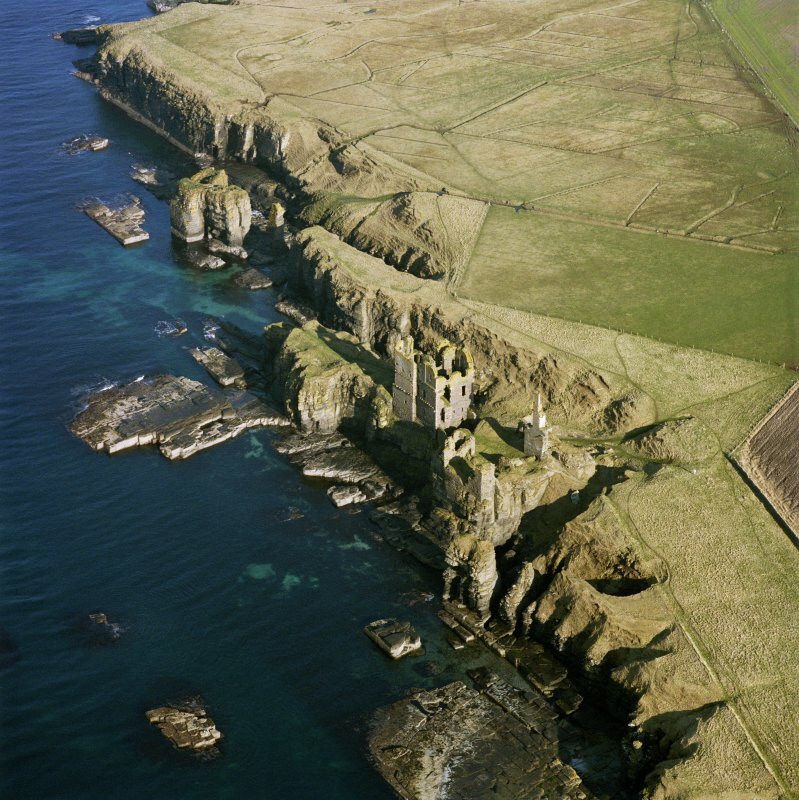 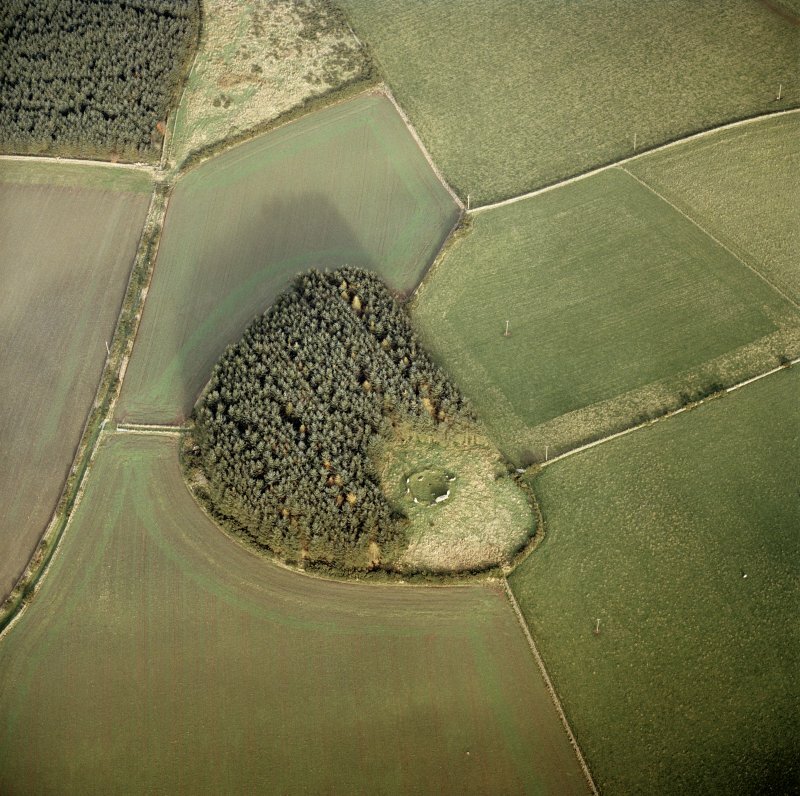 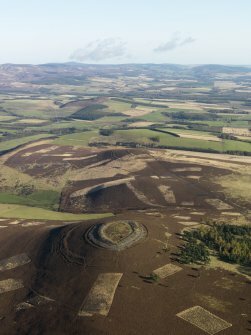 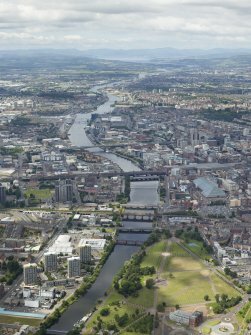 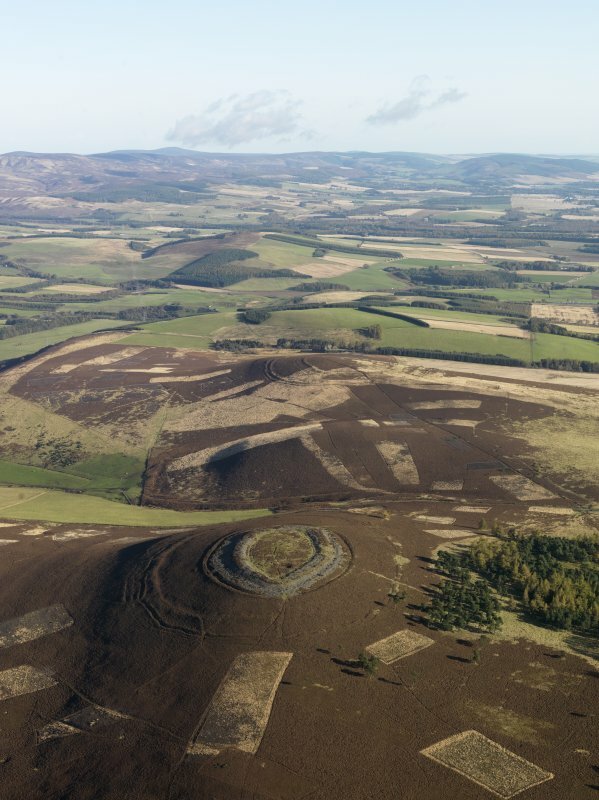 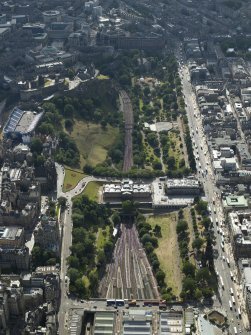 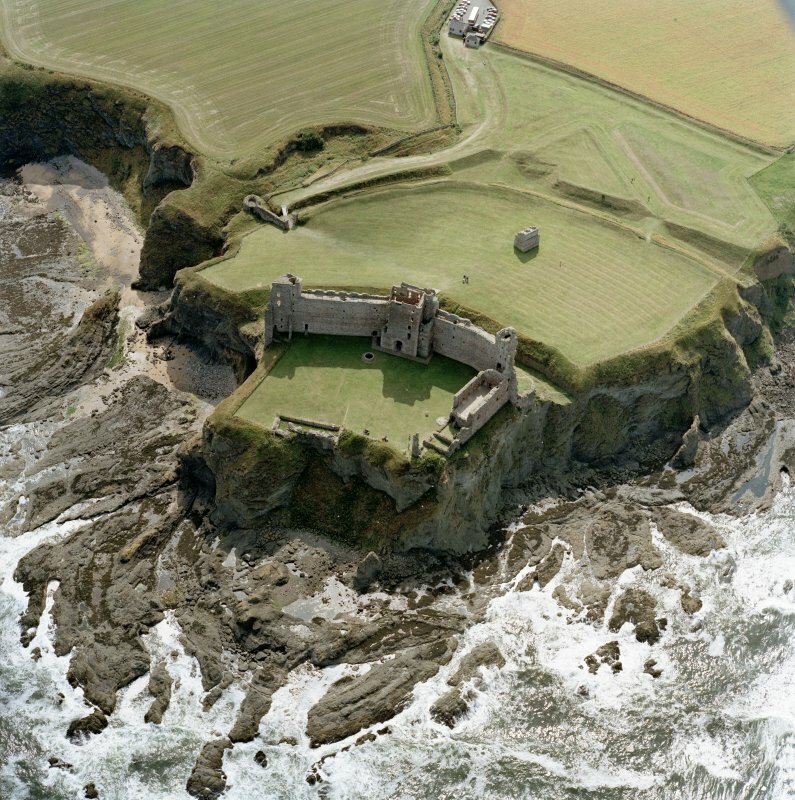 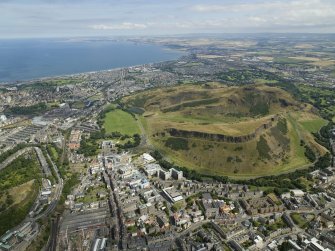 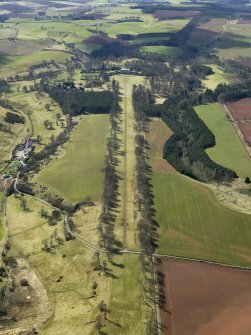 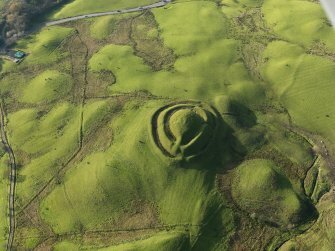 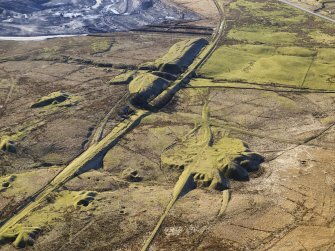 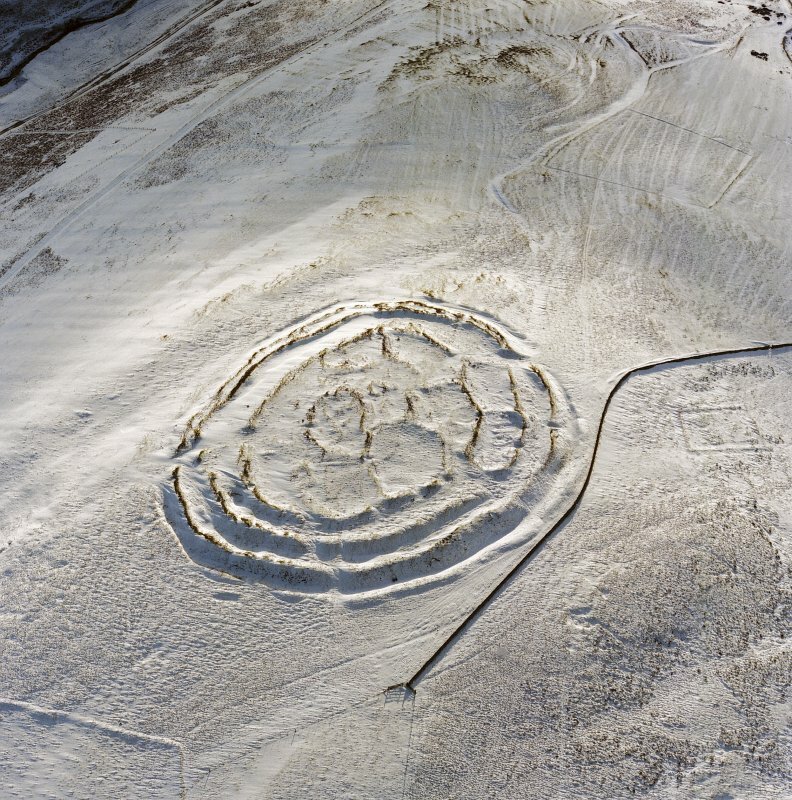 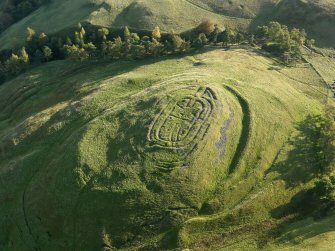 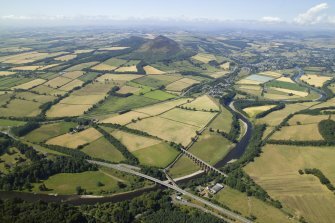 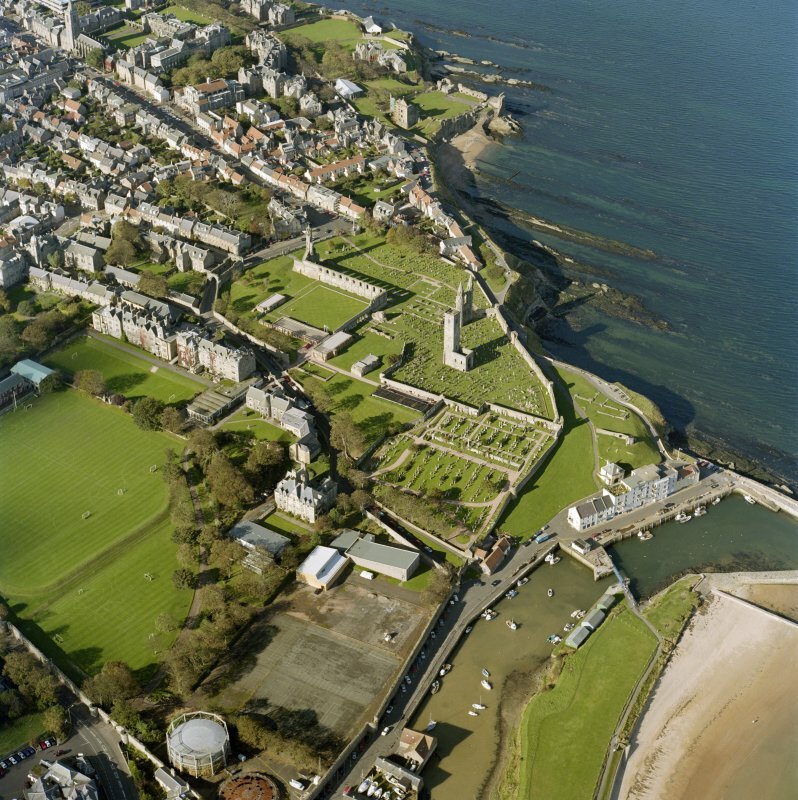 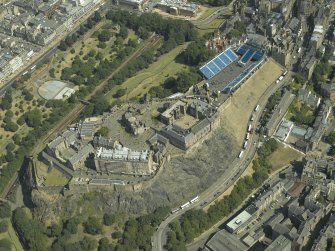 Year-on-year the National Collection, curated by the Royal Commission on the Ancient and Historical Monuments of Scotland (RCAHMS), continues to grow. 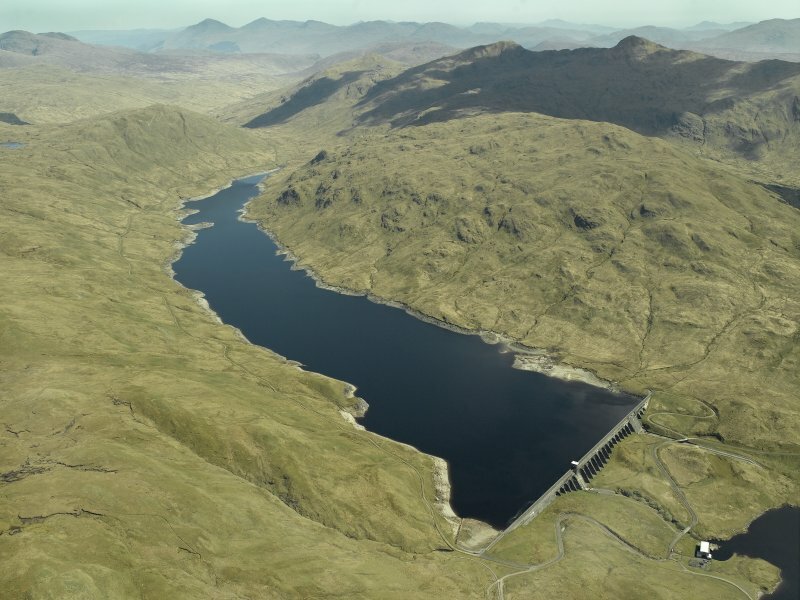 More historic photographs are discovered, more declassified military imagery is deposited, and the RCAHMS aerial survey team takes to the skies to record everything from ancient ruins found in remote glens to the gleaming new architecture and engineering of our constantly evolving landscape. Every photograph tells a story. 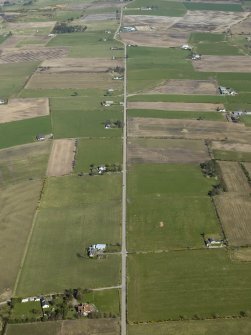 Each image is a window onto a scene of suspended time. 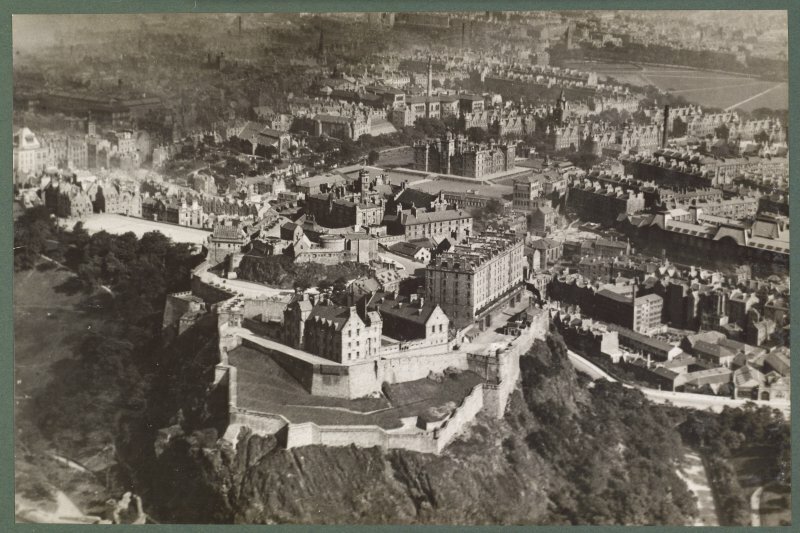 Viewed together, the millions of moments of Scotland captured over the past century are transformed into a remarkable image reel – a living, moving, growing account of the making of a modern nation. 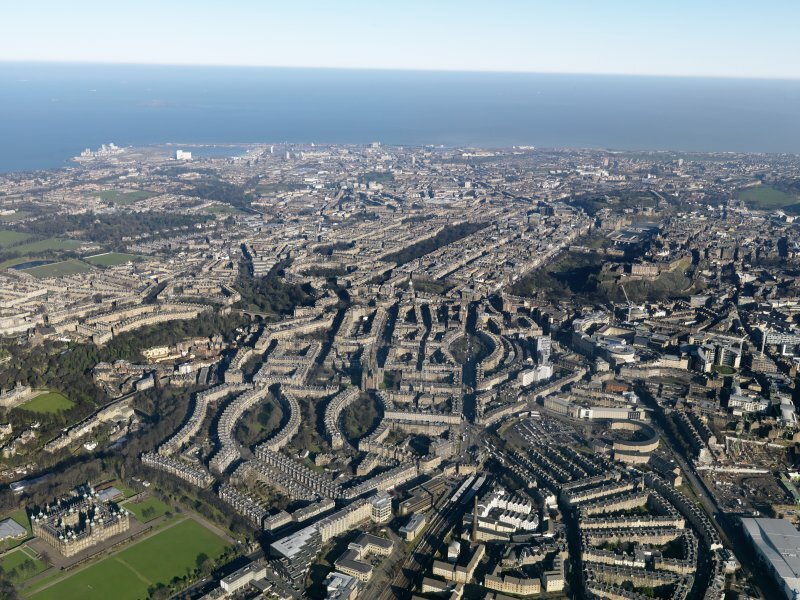 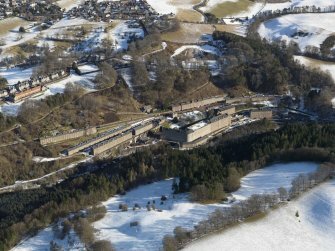 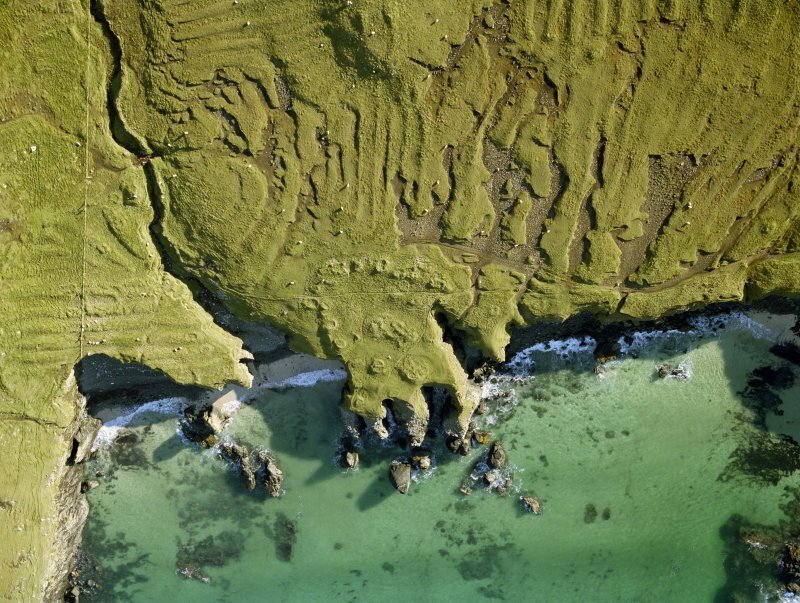 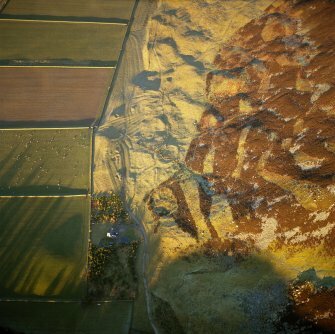 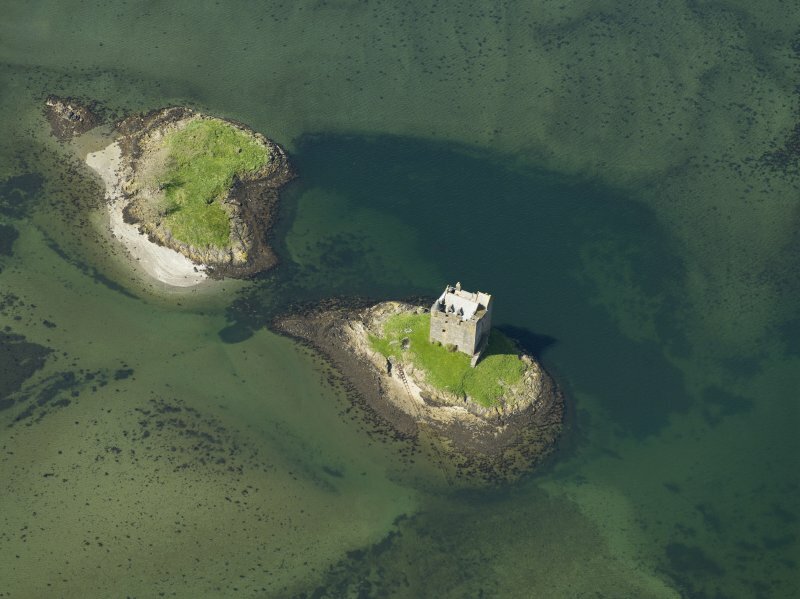 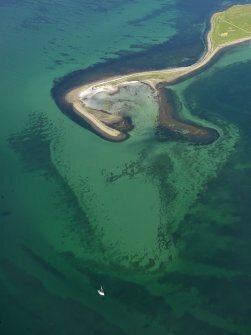 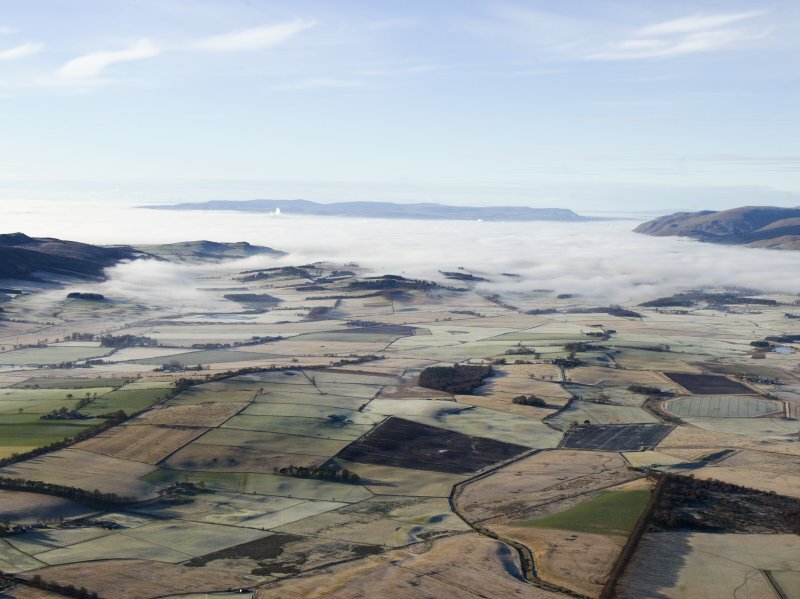 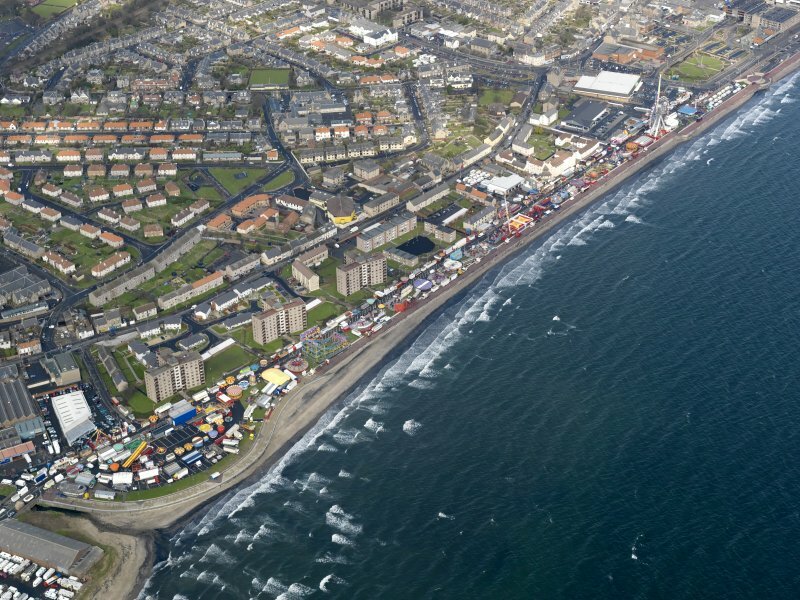 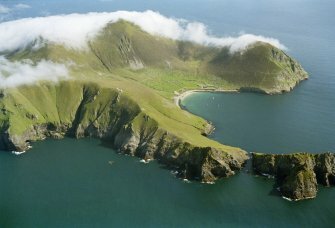 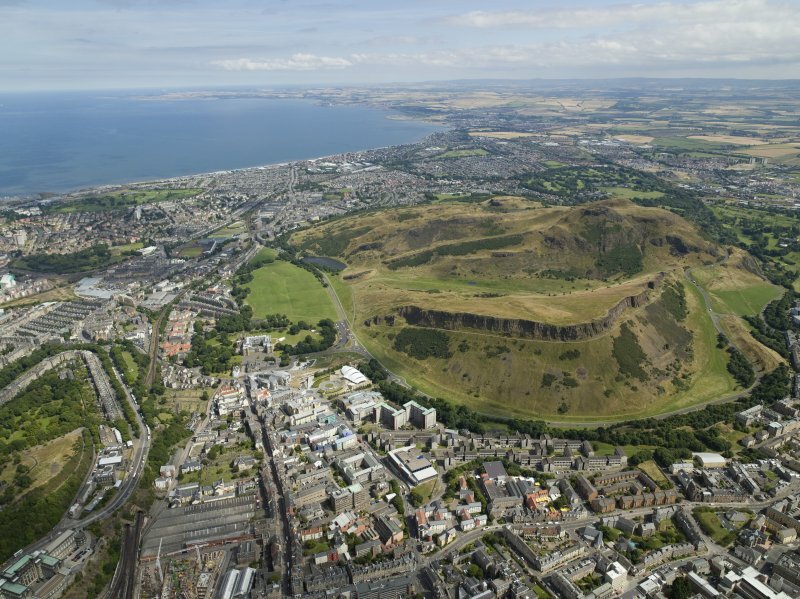 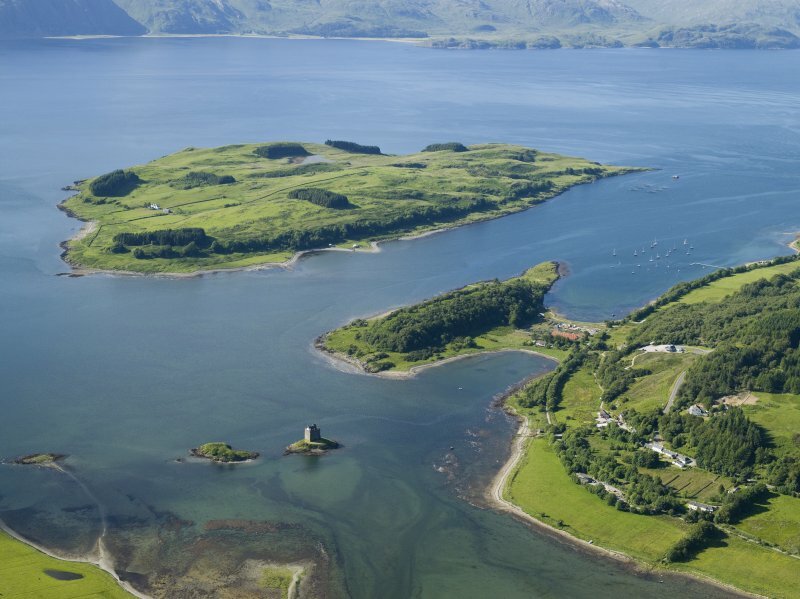 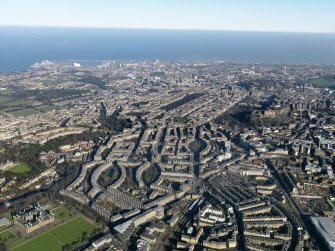 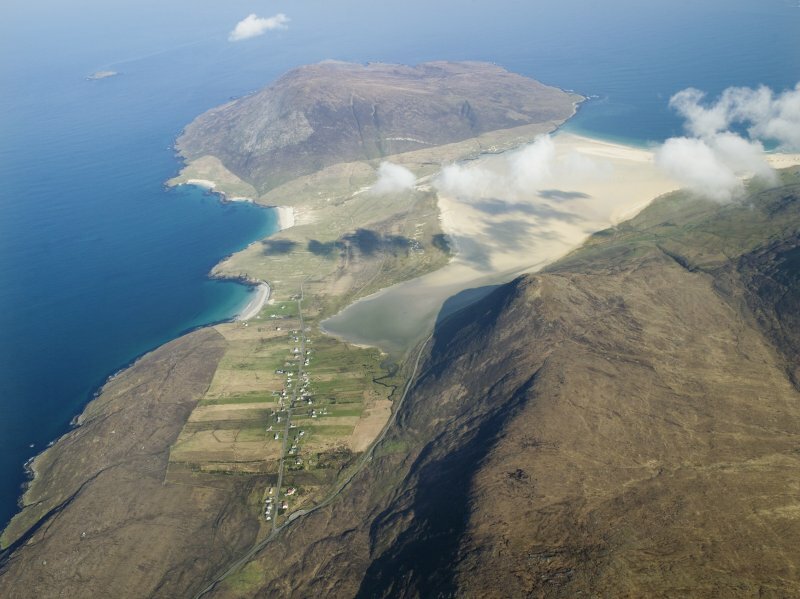 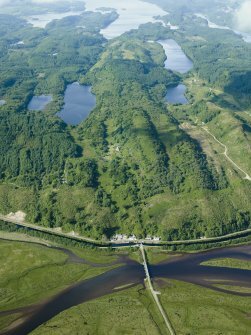 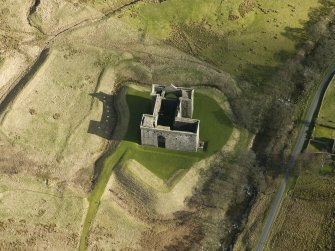 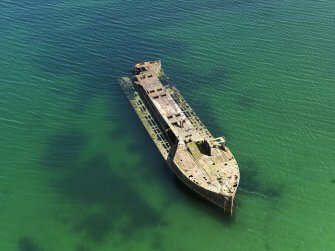 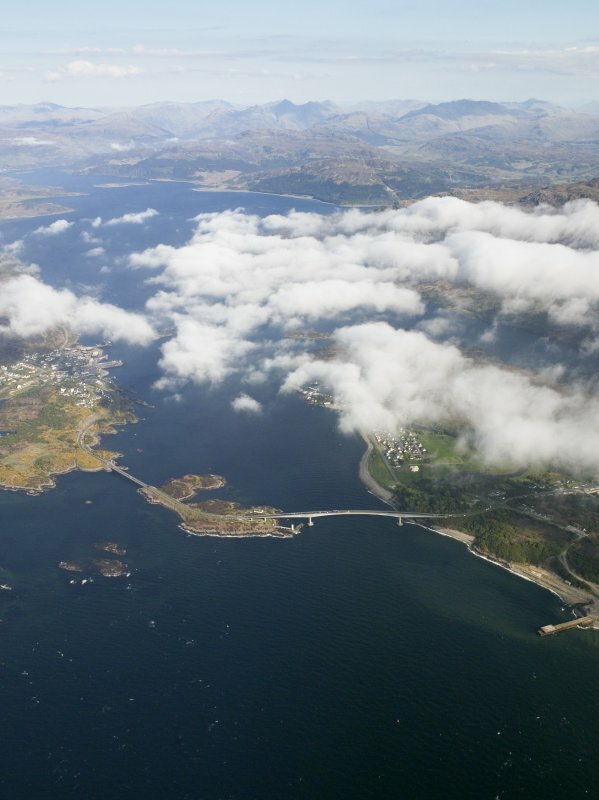 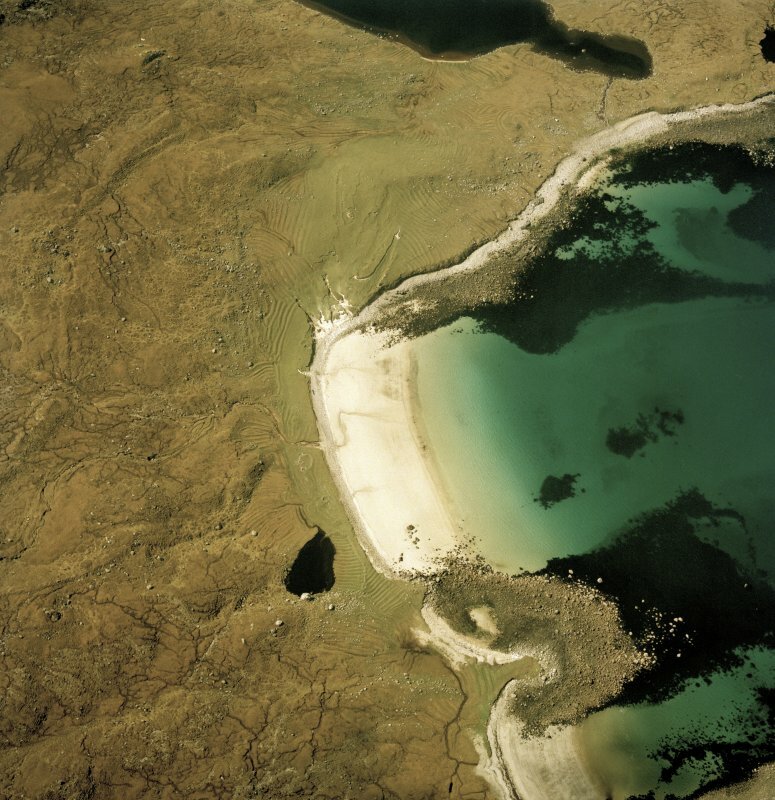 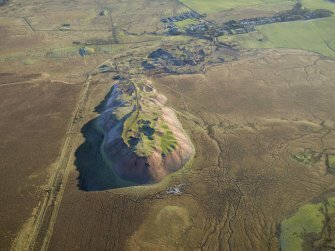 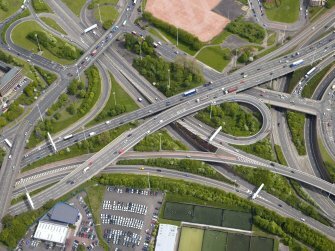 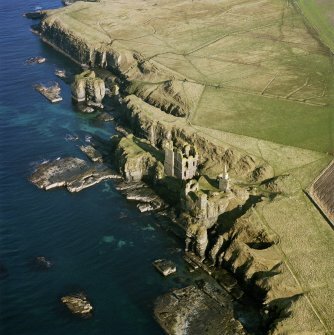 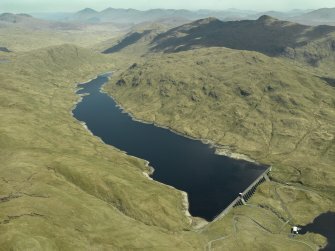 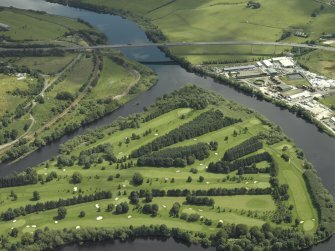 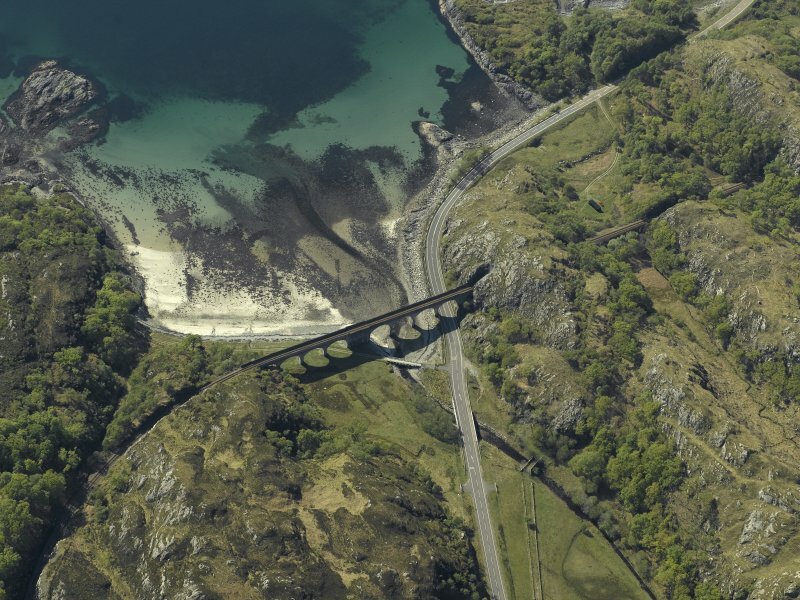 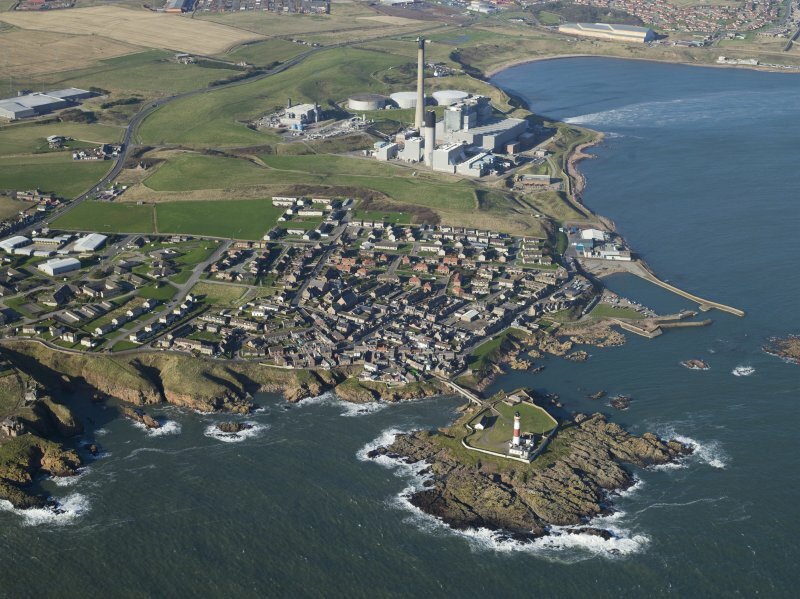 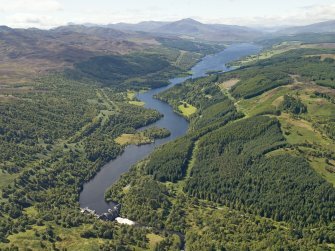 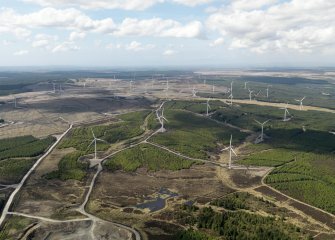 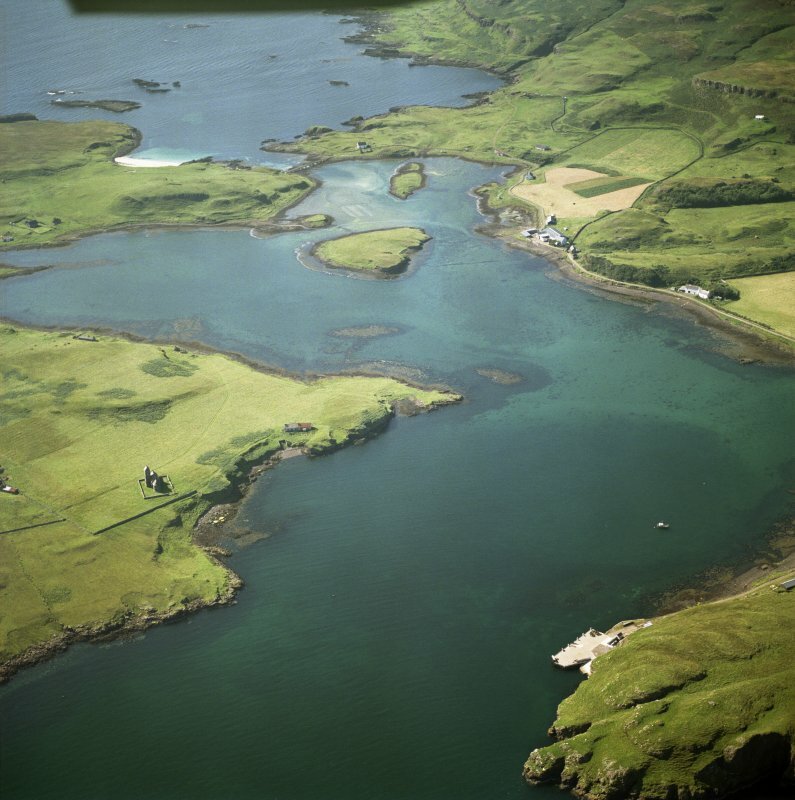 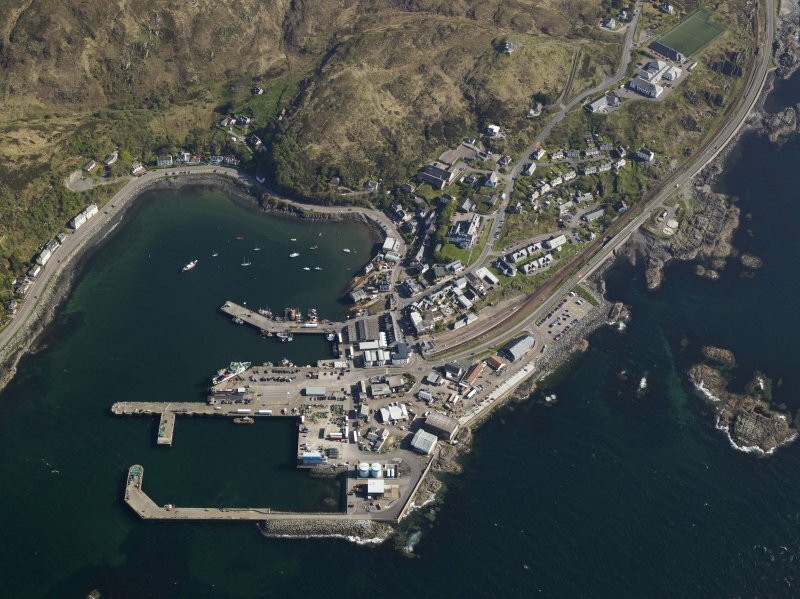 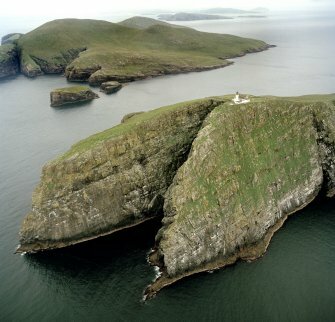 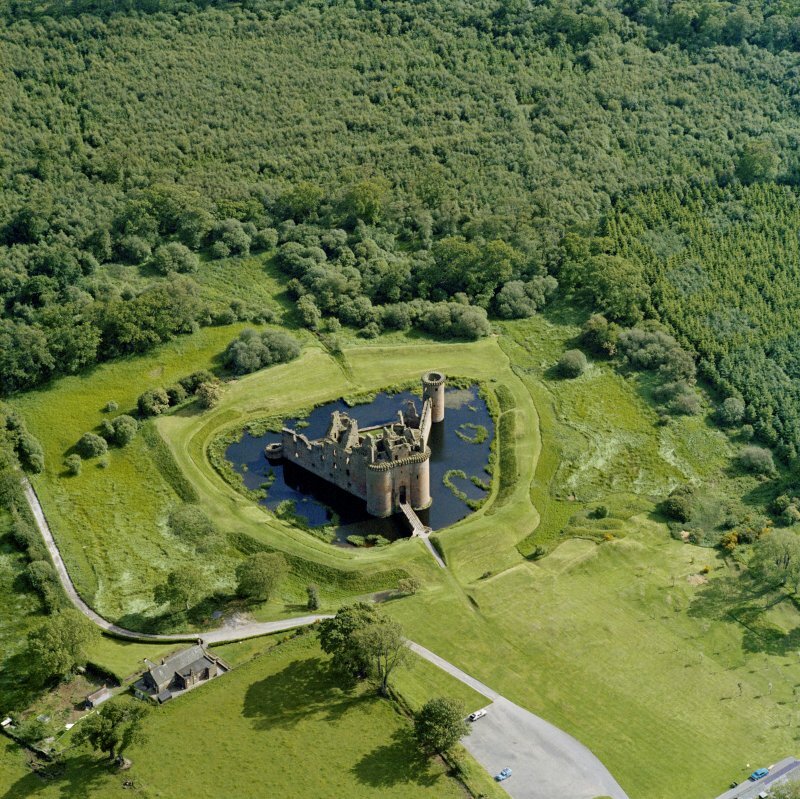 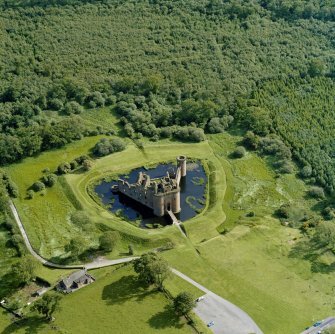 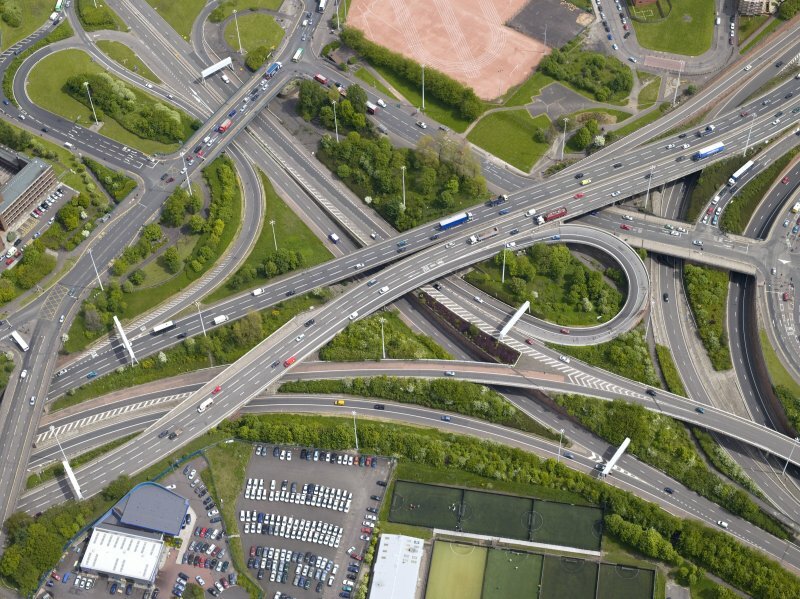 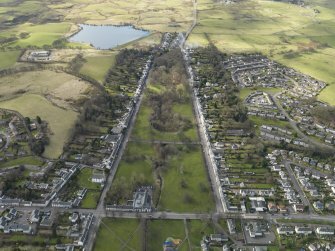 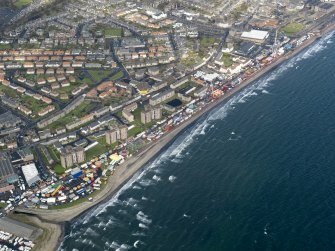 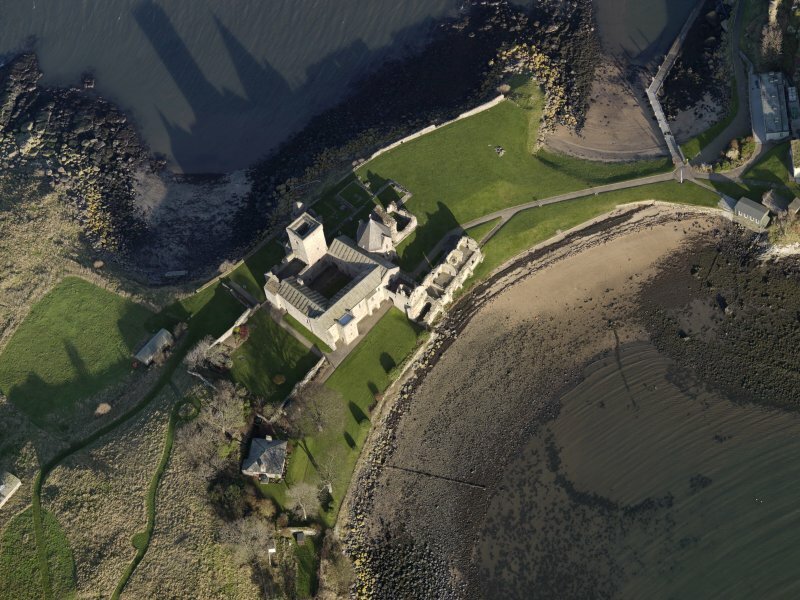 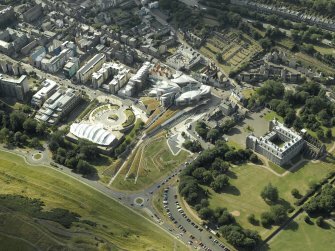 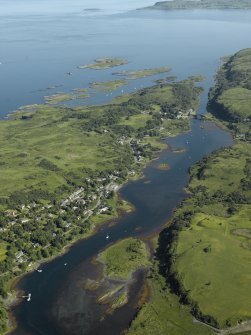 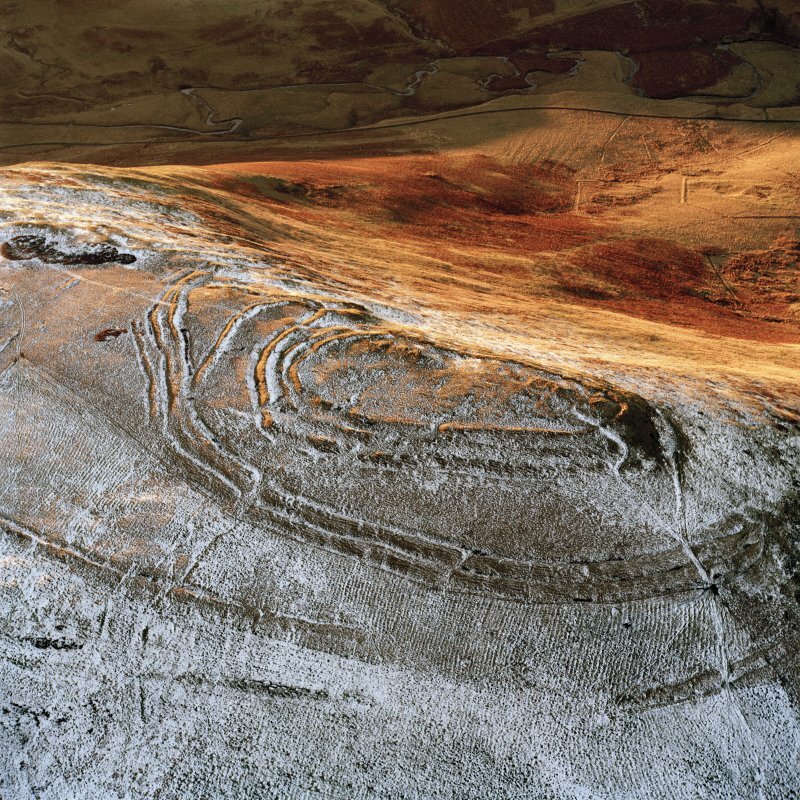 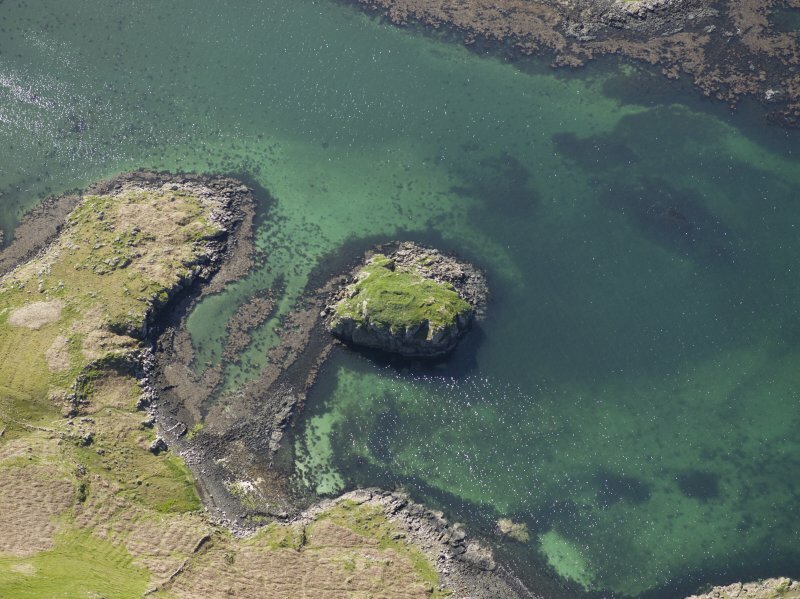 The images in this gallery come from Above Scotland: The National Collection of Aerial Photography. 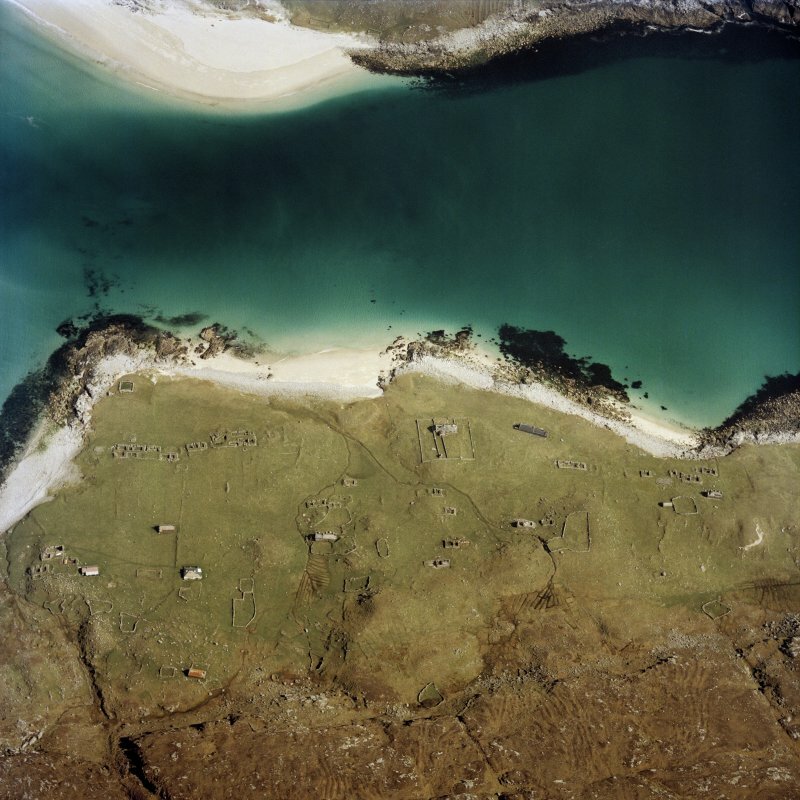 Published in a new, compact paperback edition by RCAHMS on 15 March 2014, this 224-page, lavishly illustrated book contains 200 of the finest photographs from the National Collection, with authors David Cowley and James Crawford telling the history of Scotland from a unique and fascinating perspective. Scanned image of Luftwaffe vertical air photograph of the Rolls Royce 'Merlin' aircraft engine factory at Hillington, Glasgow. 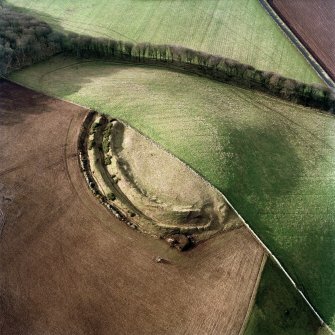 Oblique aerial view centred on the remains of the motte and castle, taken from the SE. 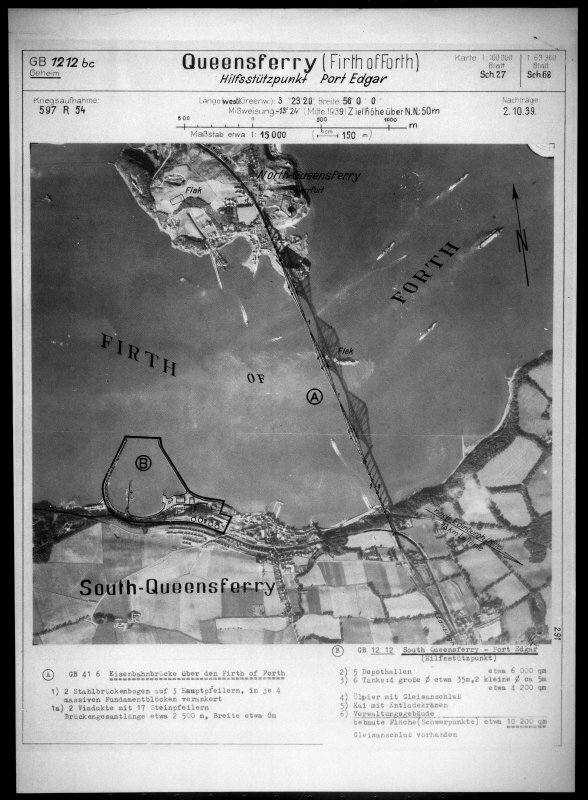 Oblique aerial view of Longcroft centred on the remains of fort, settlement, cultivation remains and cord rig, taken from the N.
Oblique aerial view of Gullane Sands centred on the remains of anti-tank blocks, taken from the NE. 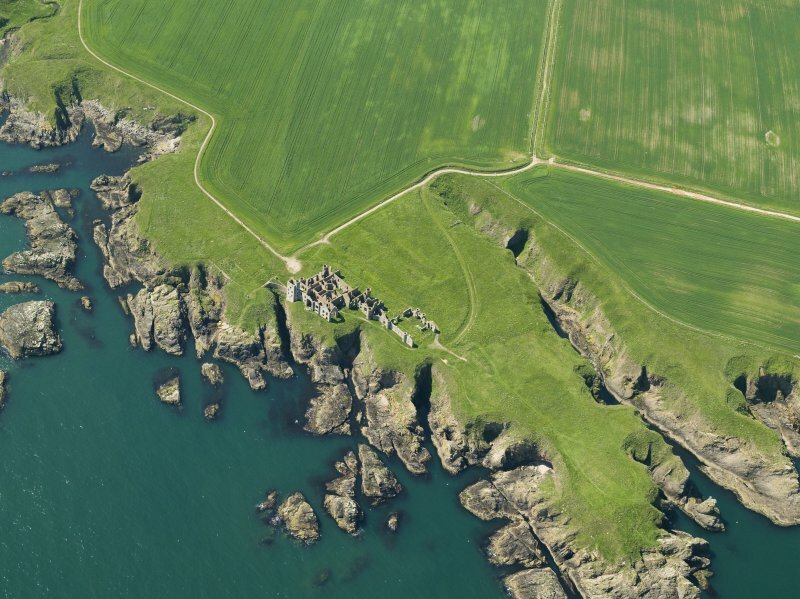 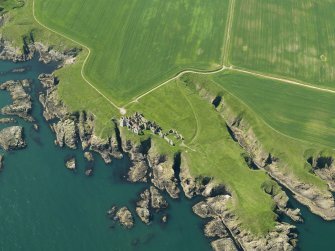 Oblique aerial view of the remains of the fishing station and homestead, Fethaland, North Roe taken from the E.
Oblique aerial photograph showing castles Girnigoe and Sinclair, Castle Haven Dyke and Noss Head, North Mounds. 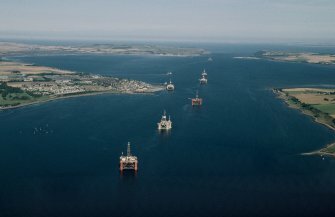 Oblique aerial view centred on oil drilling platforms in the Cromarty Firth with Invergordon adjacent, taken from the W.
Oblique aerial view centred on the remains of turf-walled buildings, taken from the ENE. 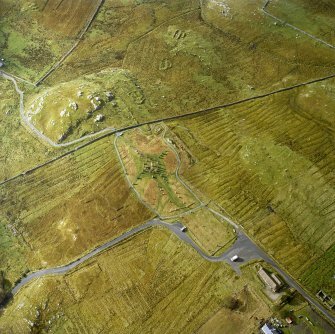 Oblique aerial view centred on the remains of the stone circle, chambered cairn and stone alignments with the township and lazy beds adjacent, taken from the NE. 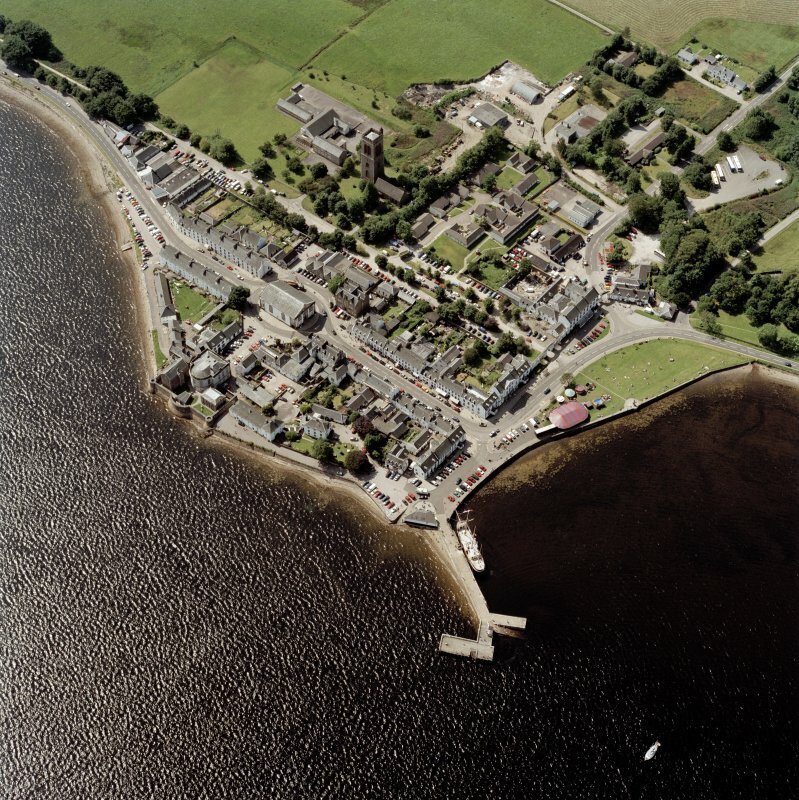 Oblique aerial view centred on the town of Inveraray, taken from the E.
Oblique aerial view centred on the country house, walled gardens and stables, taken from the SE. 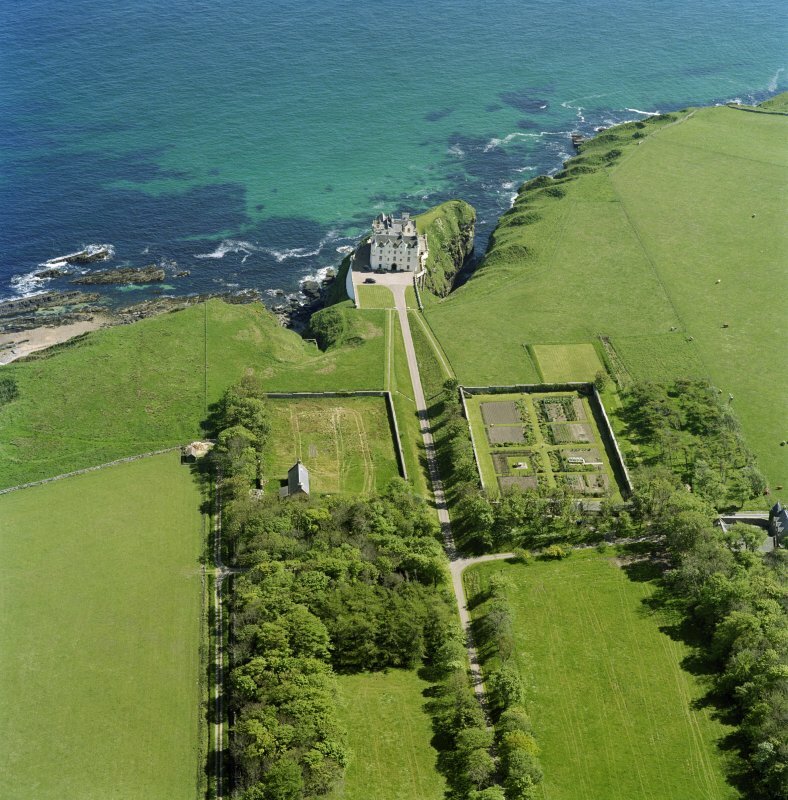 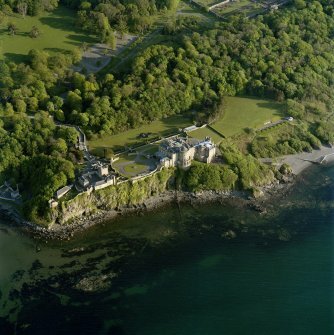 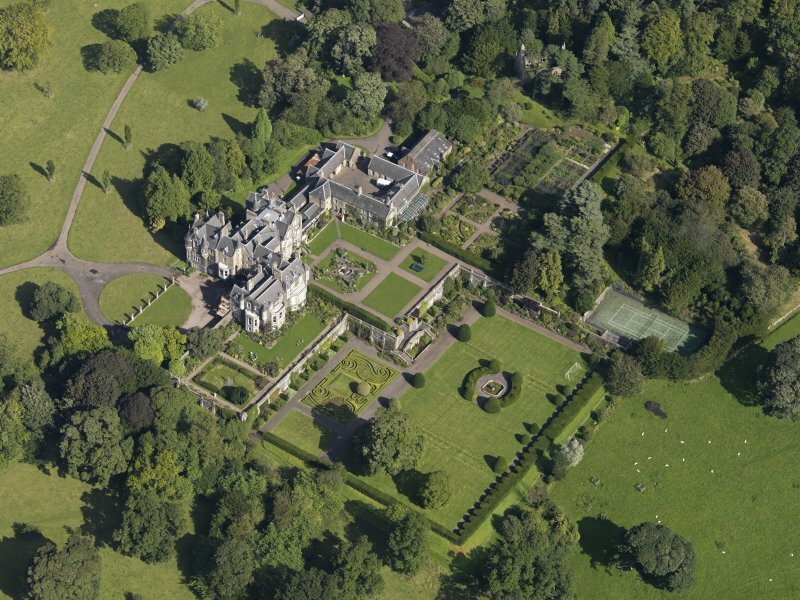 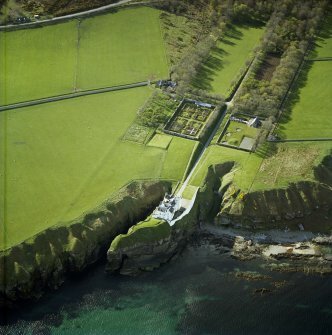 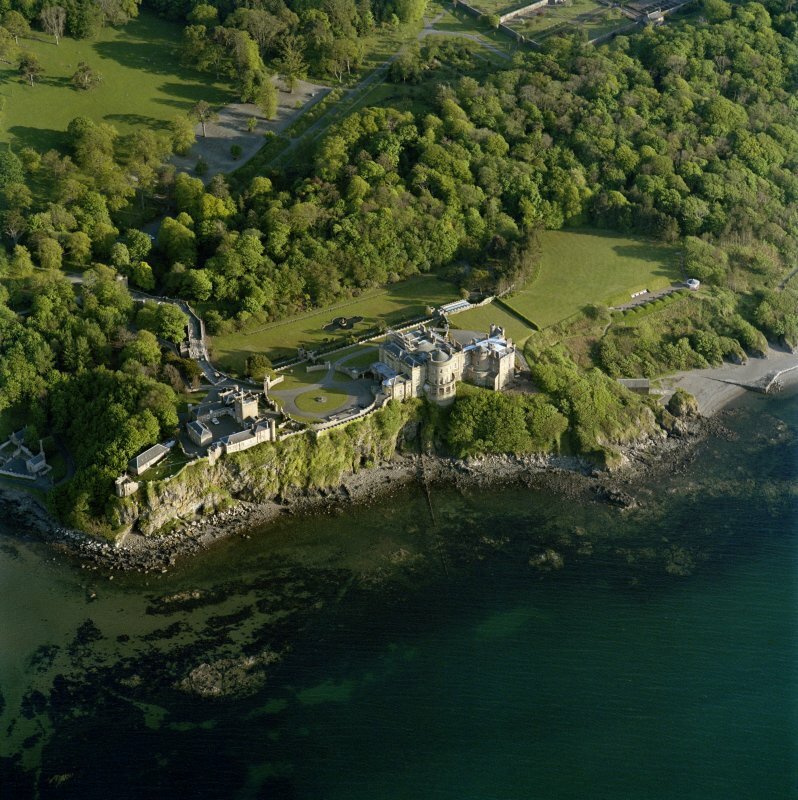 Oblique aerial view of Dunbeath Castle and walled gardens from NW. Scanned image of oblique aerial view centred on the remains of the scooped settlement and enclosure with the remains of the sheepfold, cairn and cist adjacent, taken from the SSW. 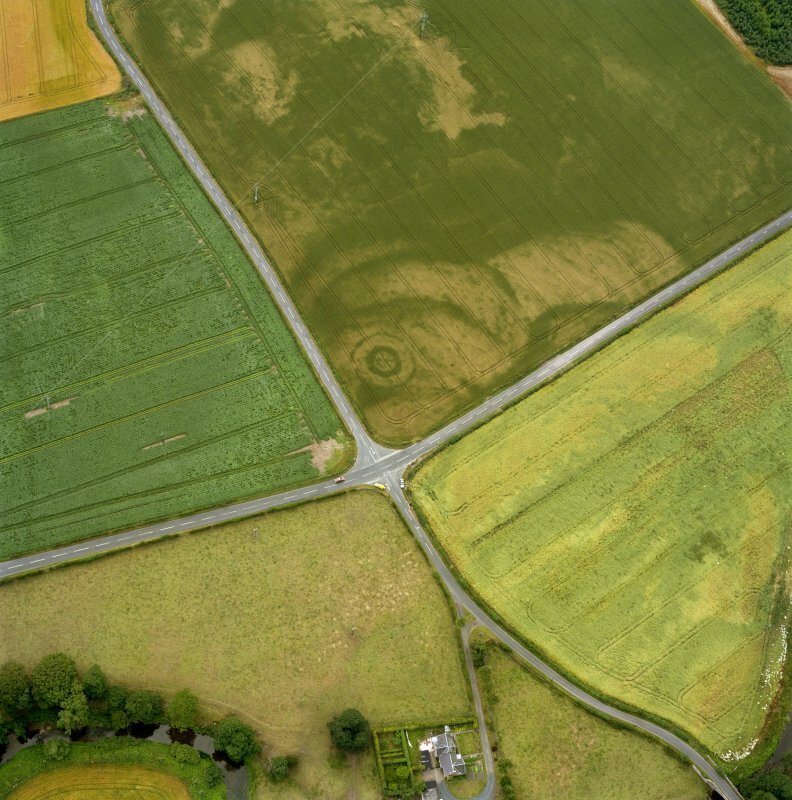 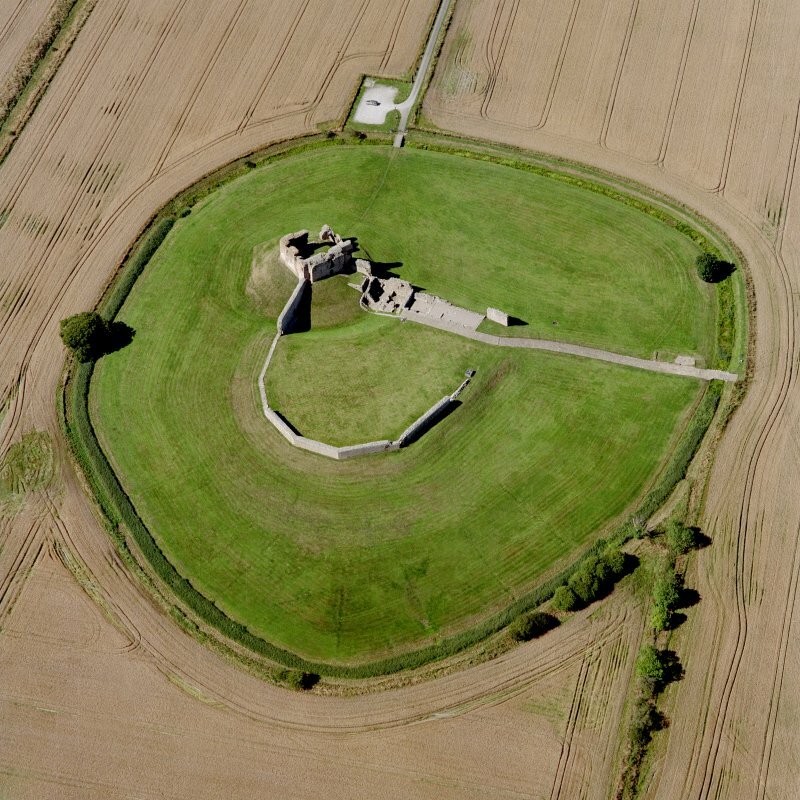 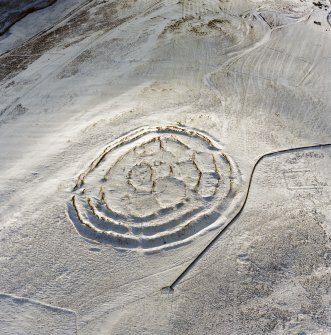 Eckford, oblique aerial view, taken from the NE, centred on the cropmarks of an enclosure suurrounding a barrow and pit-circle. 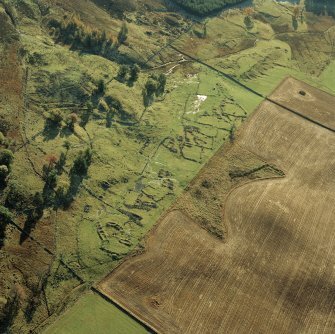 Oblique aerial view centred on the township, the remains of the buildings, burial ground, and mission house, taken from the W.
Oblique aerial view centred on the remains of the shieling huts and lazy-beds with the remains of the fish trap adjacent, taken from the ESE. 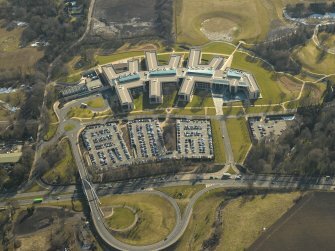 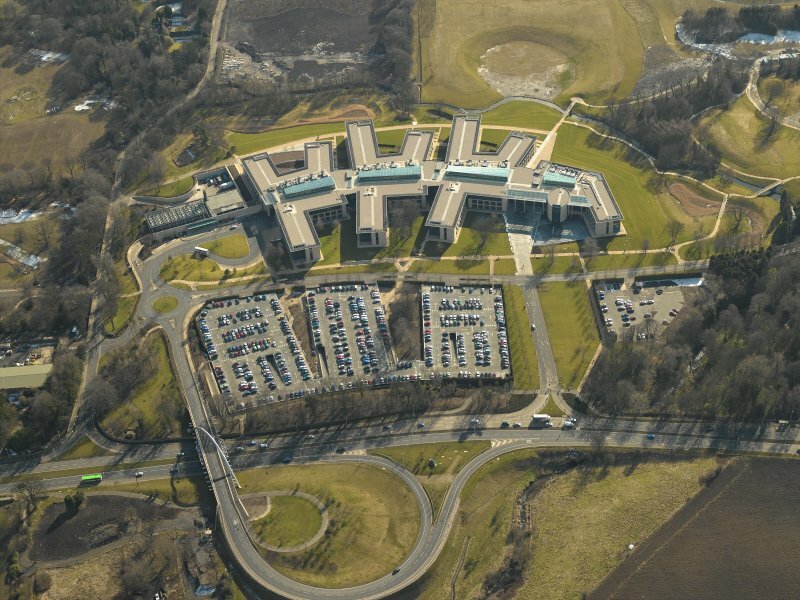 Oblique aerial view of the offices, taken from the NNW. General oblique aerial view looking West across the Gelly Burn towards the Cleish Hills. Oblique aerial view of the village, taken from the SSE. 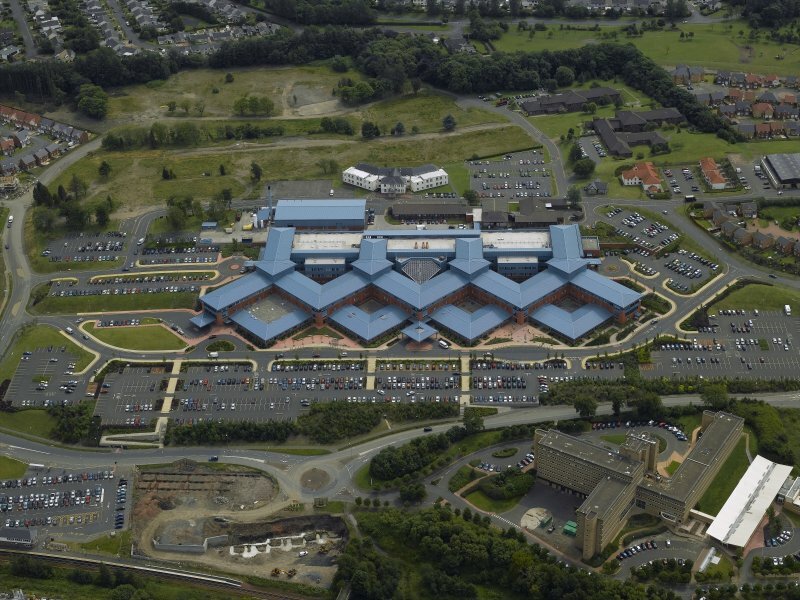 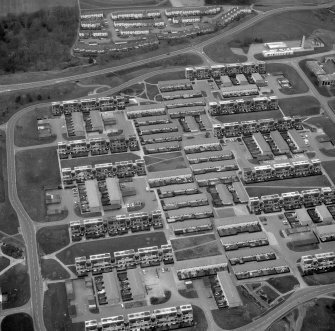 Oblique aerial view of the hospital, taken from the NNW. 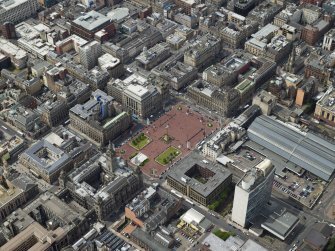 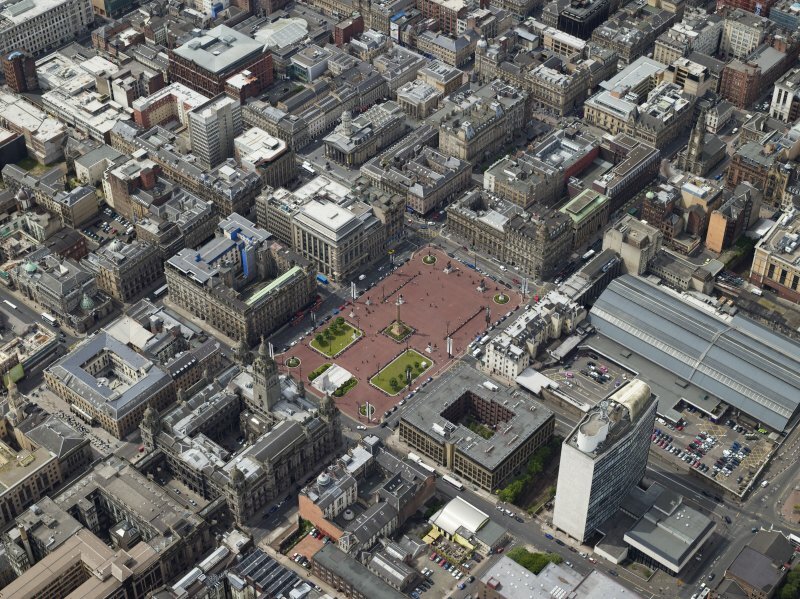 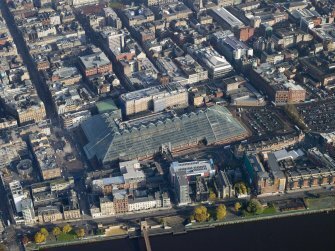 Oblique aerial view centred on the St Enoch shopping centre, taken from the SW.
General oblique aerial view of the city and the park, taken from the WSW. 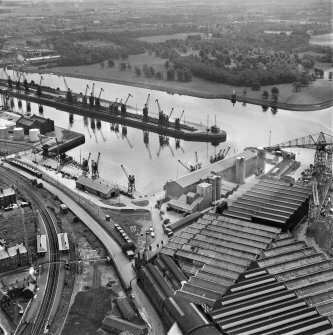 Oblique aerial view of the docks, mills and shopping centre, taken from the SE. General oblique aerial view centred on the cropmarks of the Roman fort and Roman temporary camps with the town, village and remains of the fort in the distance and the railway viaduct and road bridge in the foreground, taken from the NE. 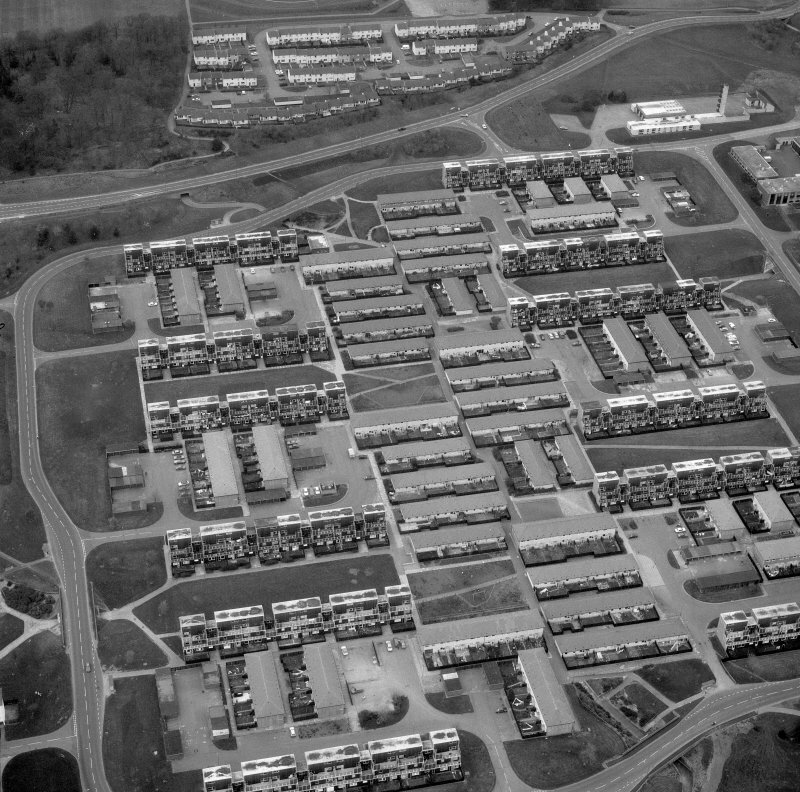 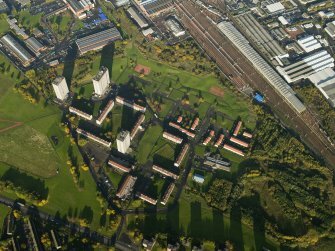 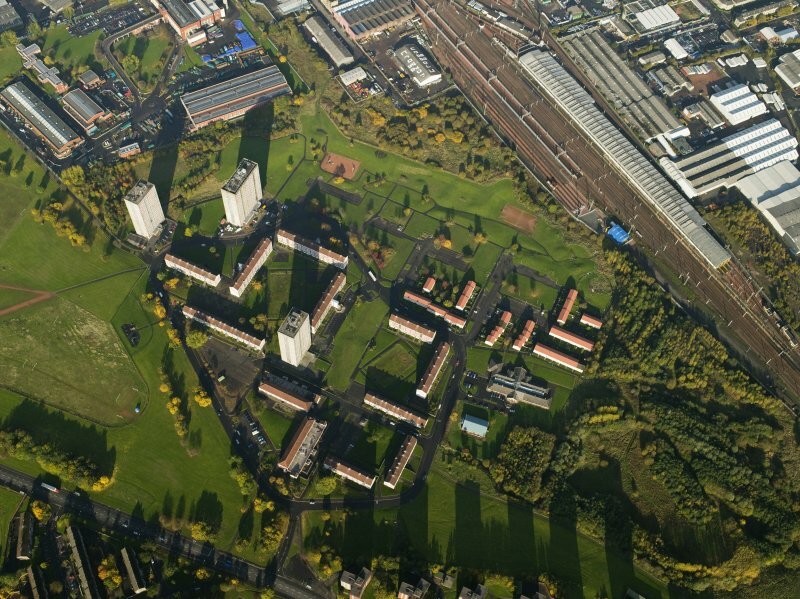 Oblique aerial view centred on the training centre, flats and housing, taken from the SE. 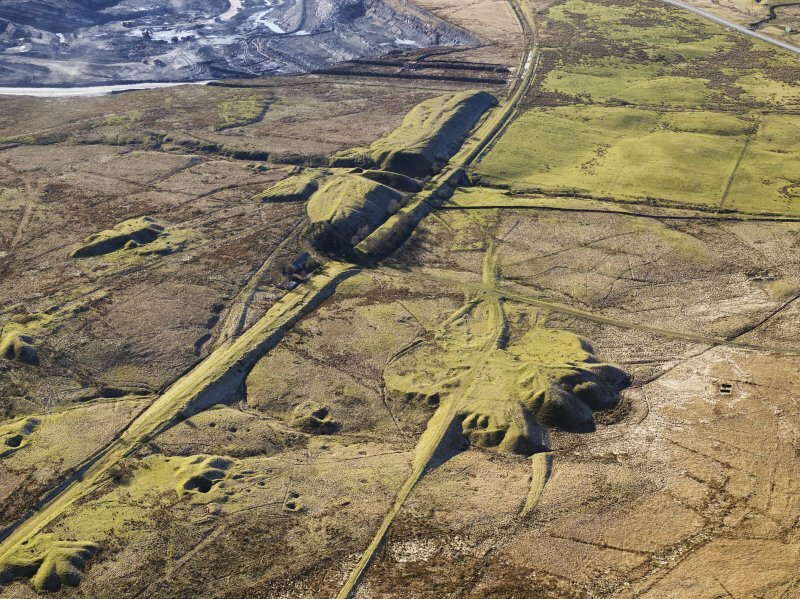 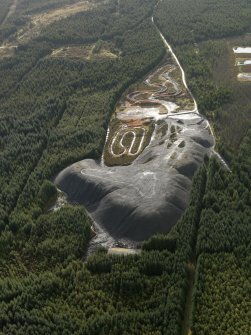 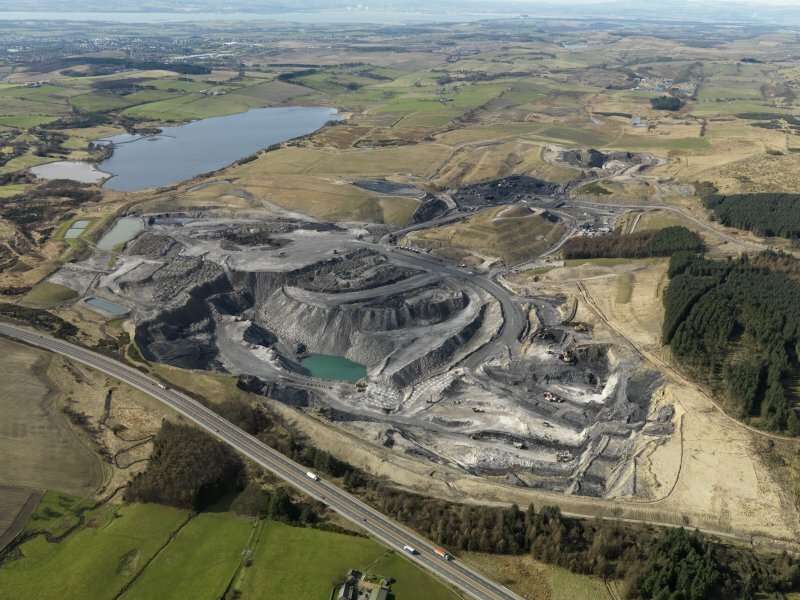 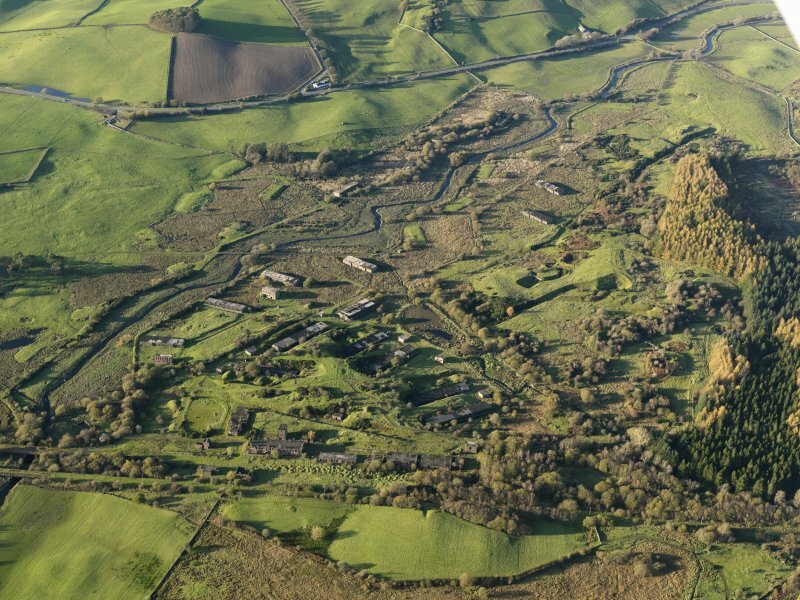 Oblique aerial view centred on the shale-oil works, remains of the shale bings and shale-oil mines with the village and remains of the rig adjacent, taken from the WNW. 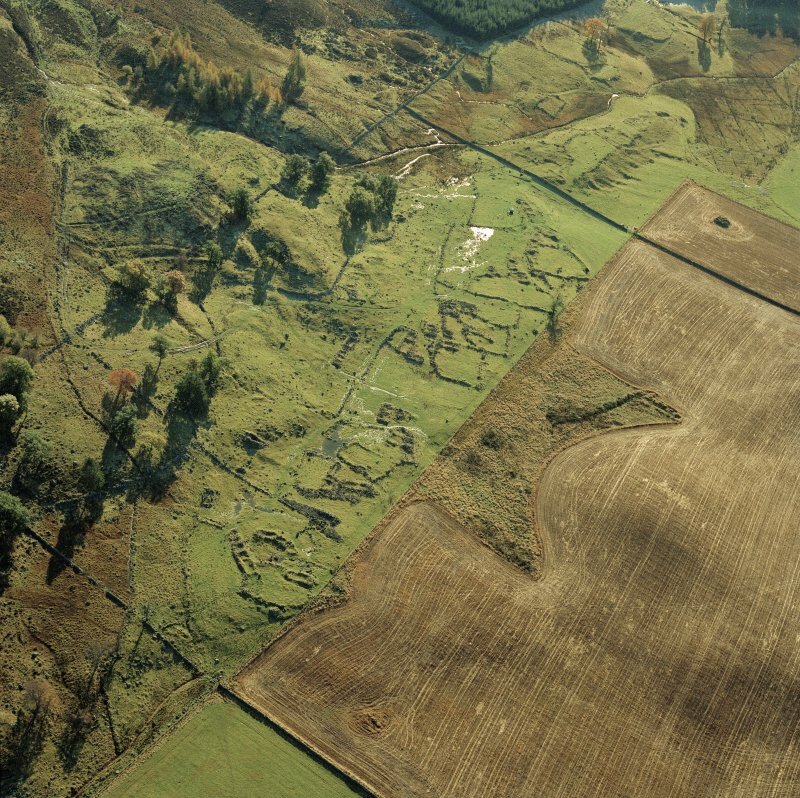 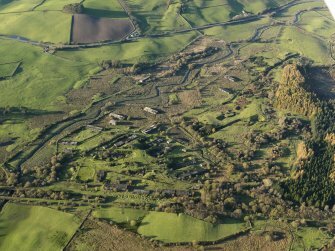 Oblique aerial view centred on the remains of the cultivation terraces, rig and sheepfold, taken from the ESE. Oblique aerial view centred on Edinburgh Castle with the Military Tattoo stands set up on the esplanade, taken from the SW.
Oblique aerial view centred on the remains of the coal mines, bell pits and dismantled railway, taken from the NE. 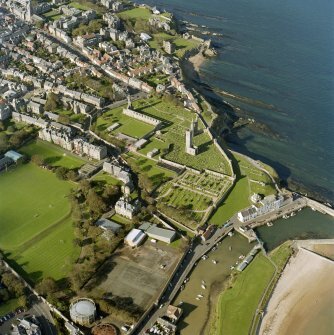 General oblique aerial view of the town, centred on the oil refinery, stadium and docks, taken from the S.
General oblique aerial view centred on the avenue with the country house, walled garden, tower and stable in the distance, taken from the NE. 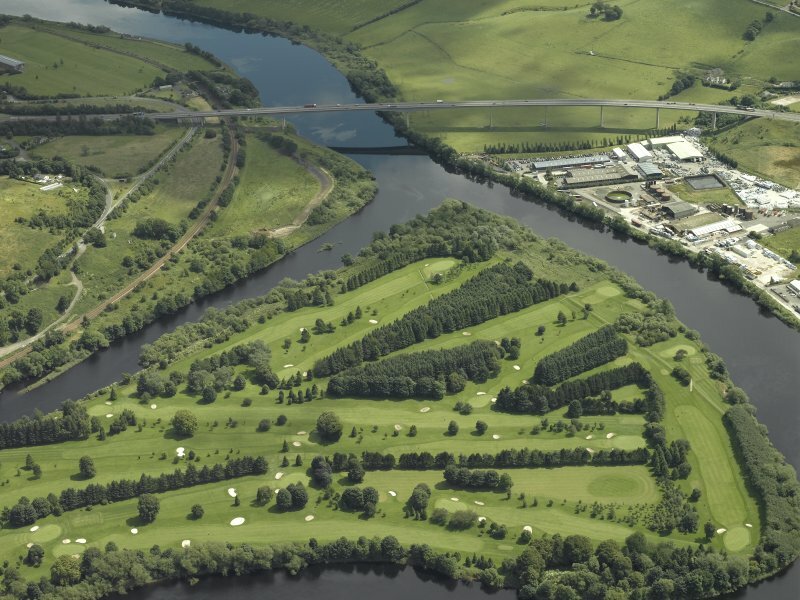 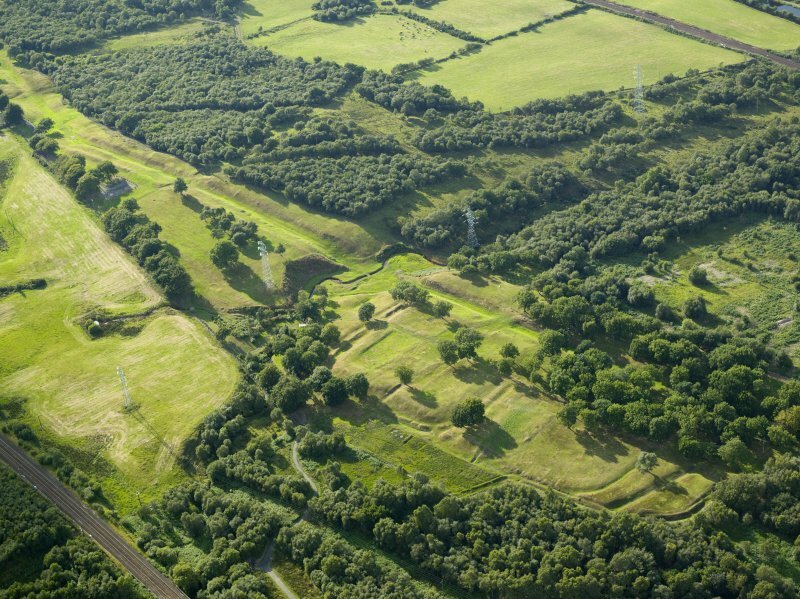 General oblique aerial view centred on the remains of the Roman fort and the course of the Antonine Wall, taken from the SE. 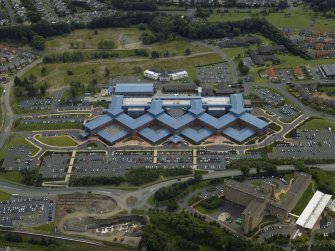 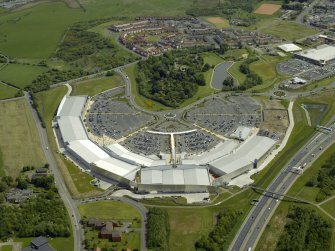 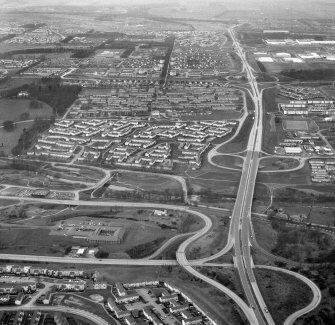 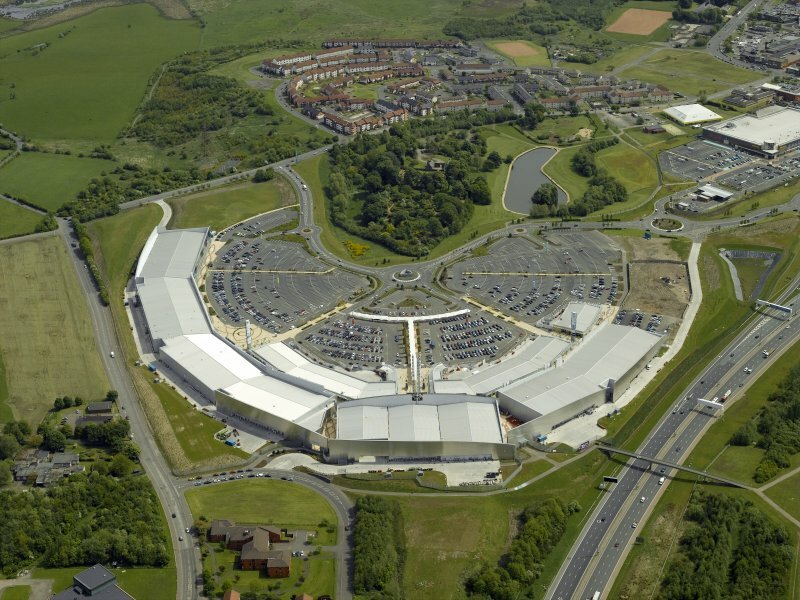 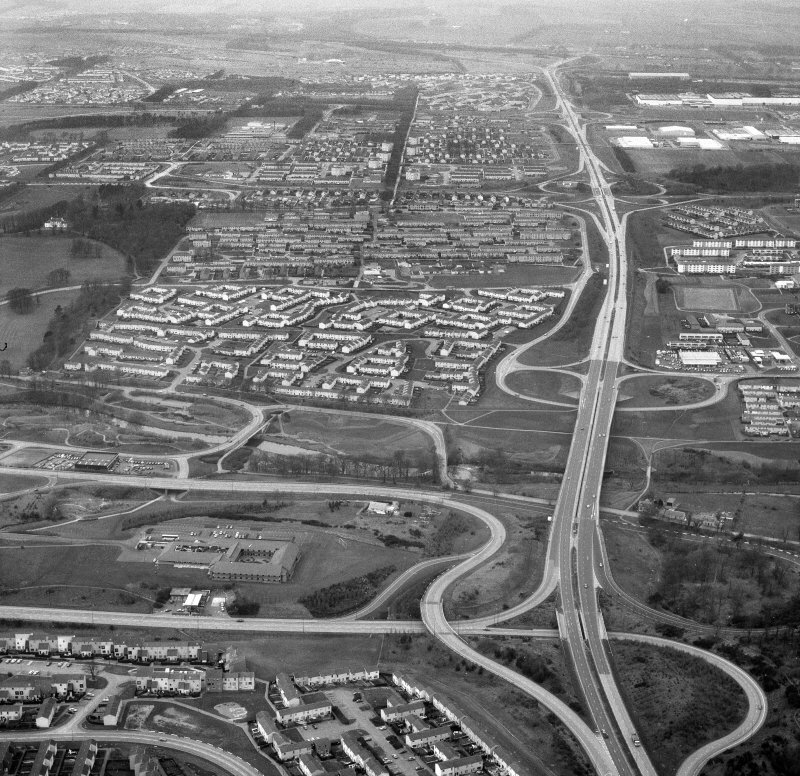 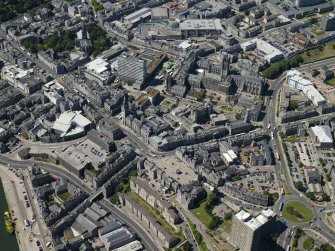 Oblique aerial view centred on the shopping centre with the laird's house adjacent, taken from the WSW. 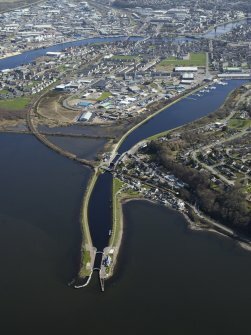 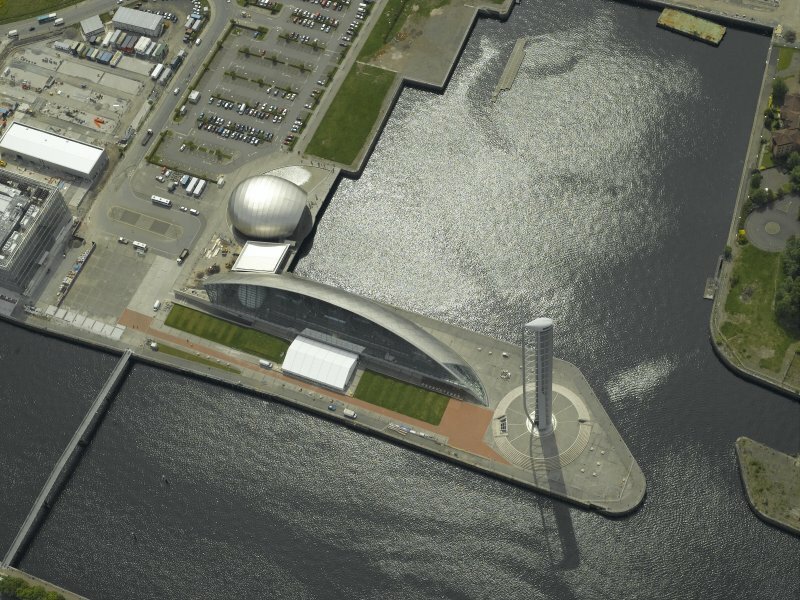 Oblique aerial view centred on the science centre, taken from the N.
General oblique aerial view centred on the harbour, taken from the SSE. 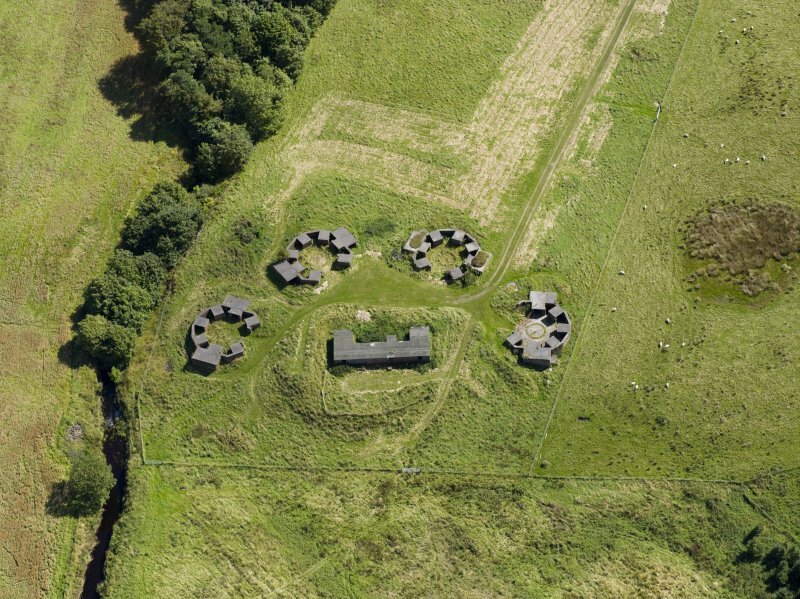 Oblique aerial view of Throsk Royal Navy Armament Depot. Explosives store from NW. General oblique aerial view centred on the castle with the village adjacent, taken from the SSE. 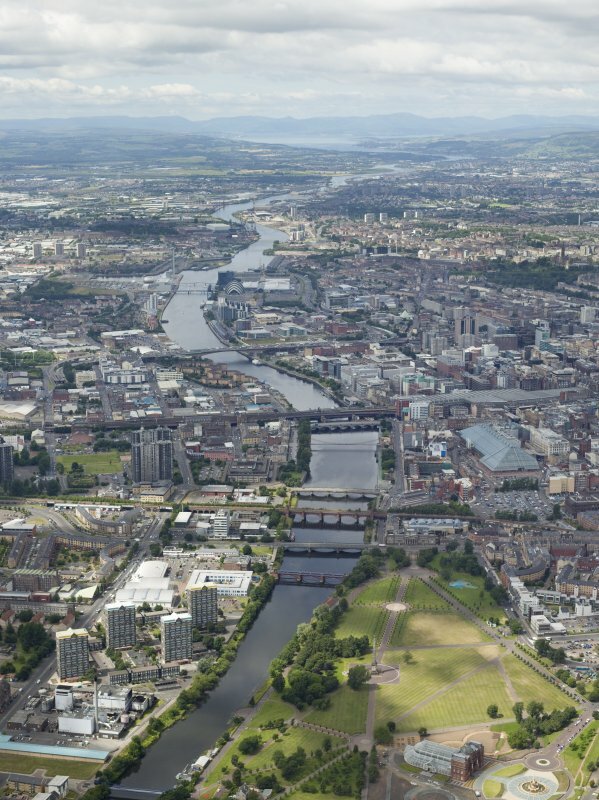 General oblique aerial view centred on the canal basin, quays and bridge, taken from the NE. Oblique aerial view of the island, centred on the remains of the slate quarries, taken from the SE. 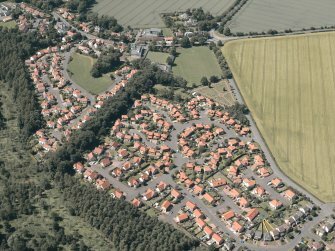 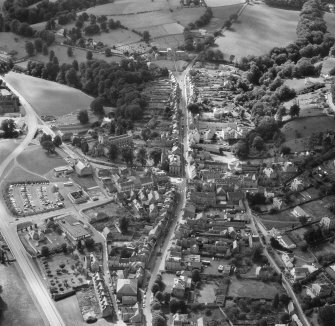 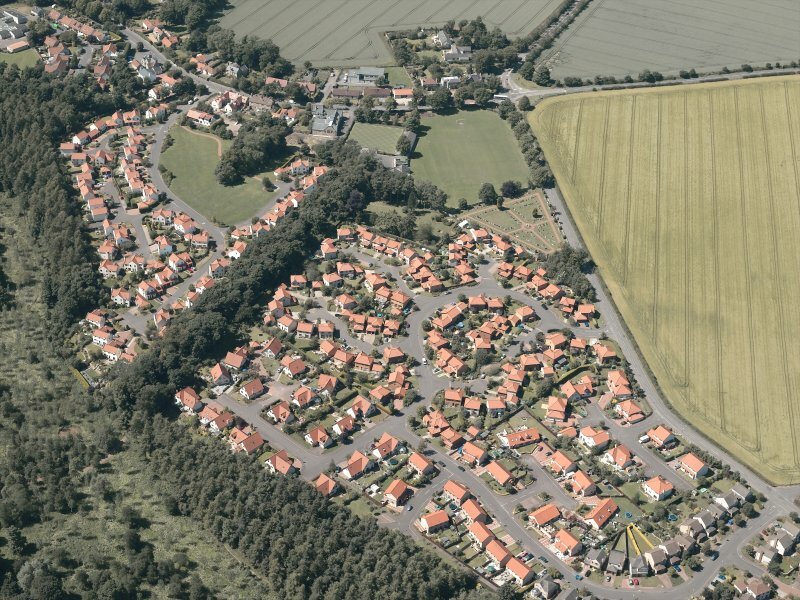 General oblique aerial view centred on the village, taken from the SSE. 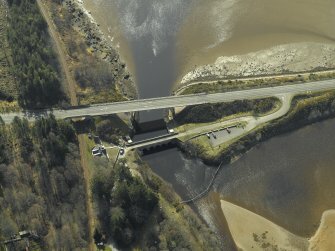 Oblique aerial view centred on the road bridge with the hotel adjacent, taken from the WSW. 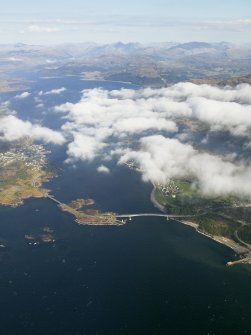 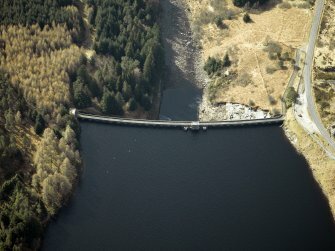 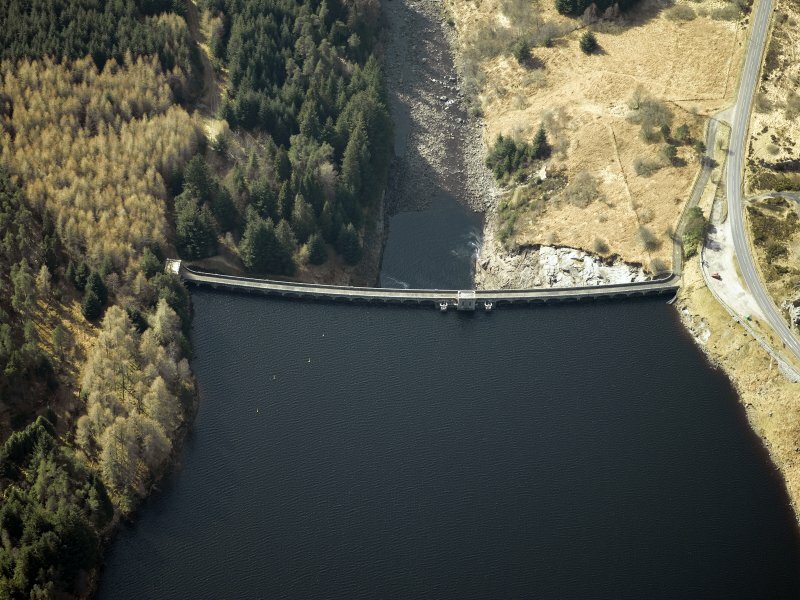 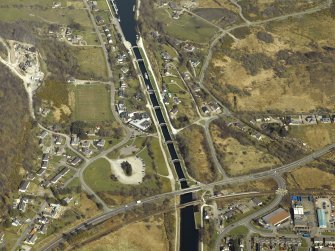 Oblique aerial view centred on the dam, taken from the ENE. 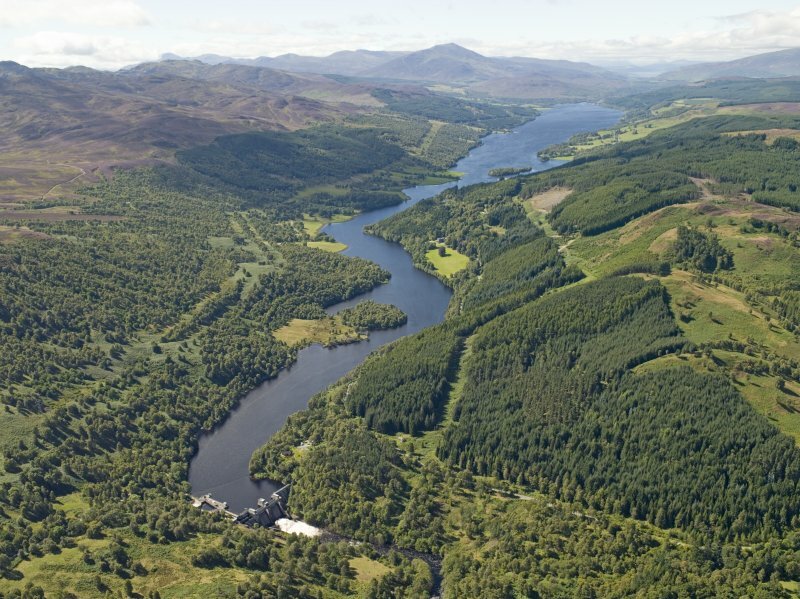 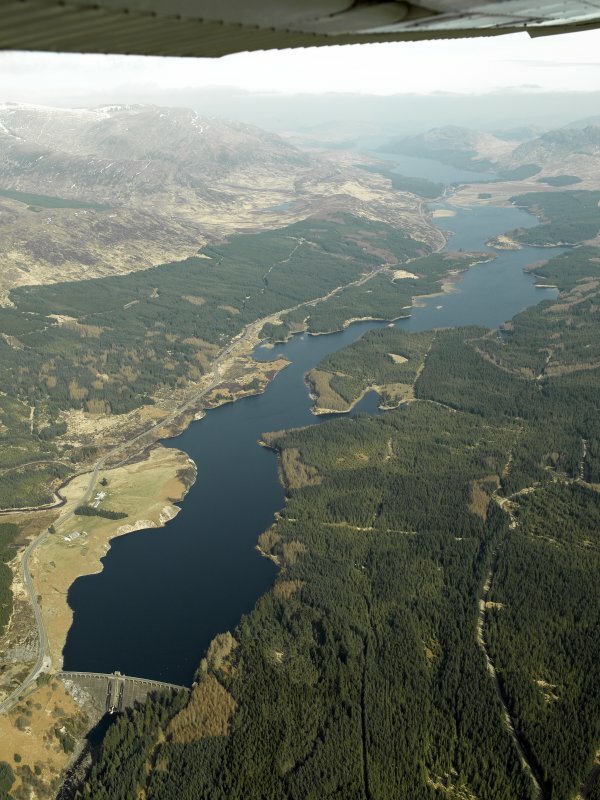 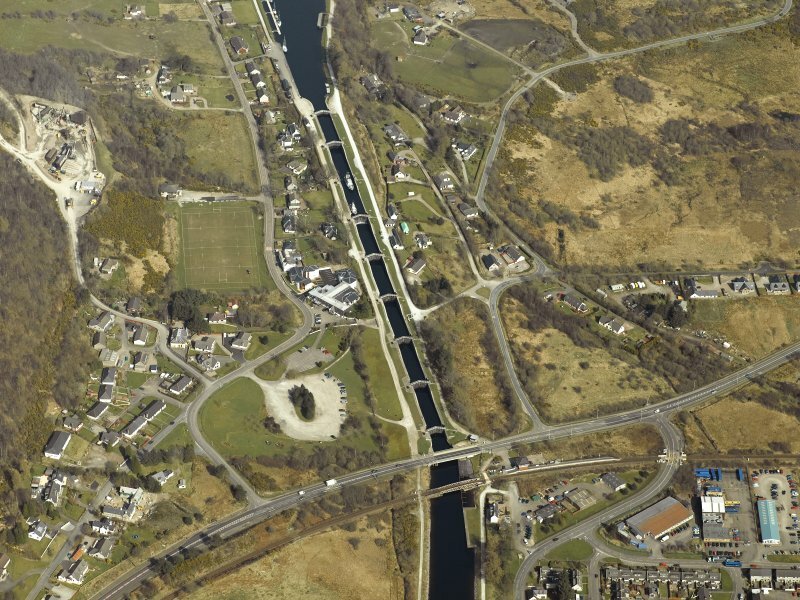 General oblique aerial view of Loch Laggan centred on the dam with the farmstead adjacent, taken from the SW.
Oblique aerial view centred on the canal at Neptune's Staircase, locks, swing bridges and railway bridge, taken from the SW.
General oblique aerial view centred on the town with Ben Nevis in the distance, taken from the WNW. General oblique aerial view of the village centred on the pattern of dispersed buildings and layout of regular fields, taken from the WSW. 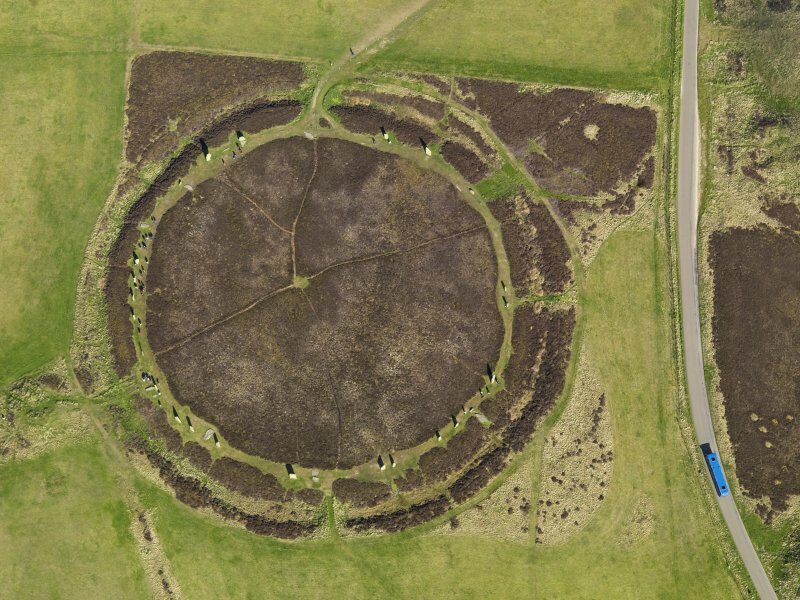 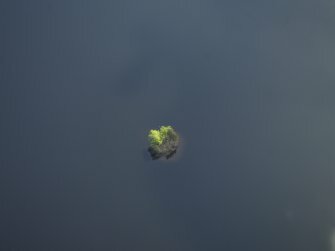 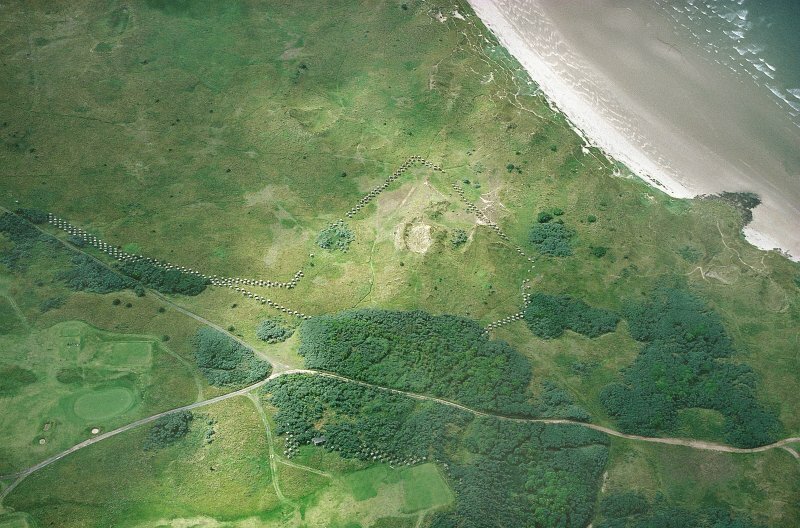 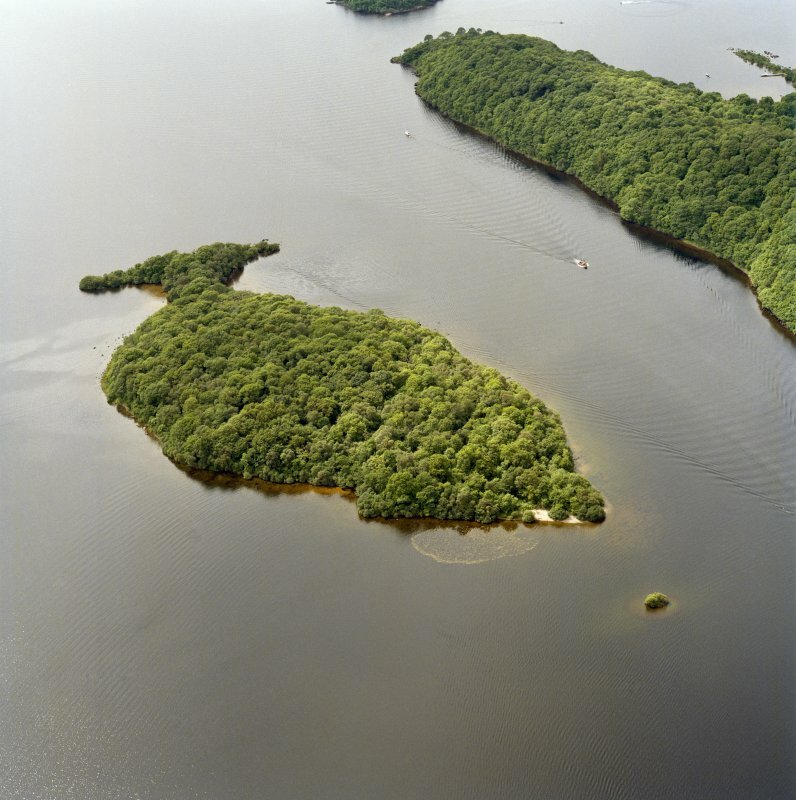 Oblique aerial view centred on the remains of the crannog. 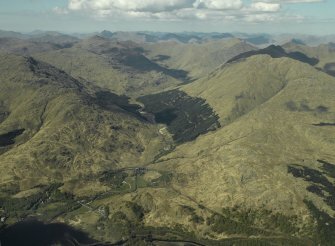 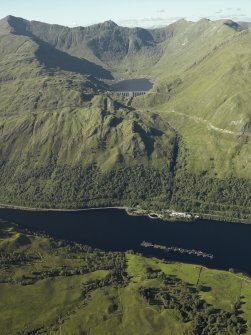 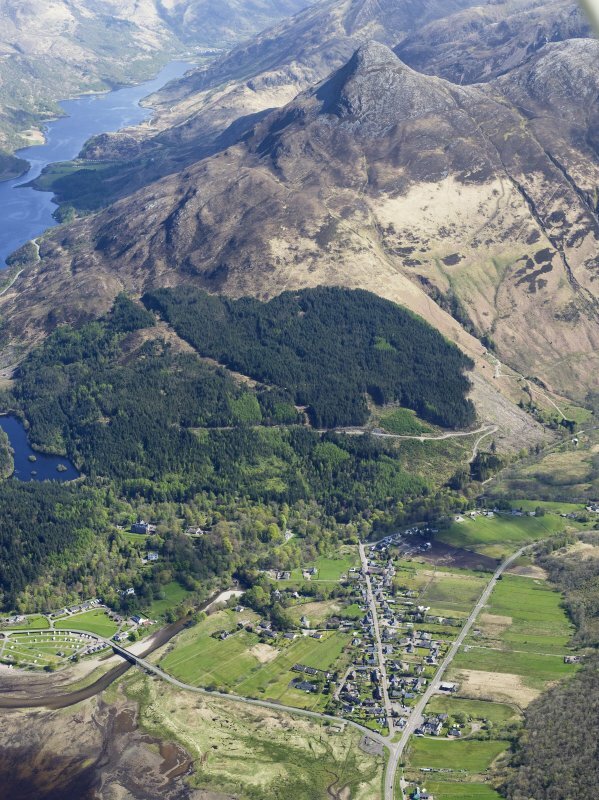 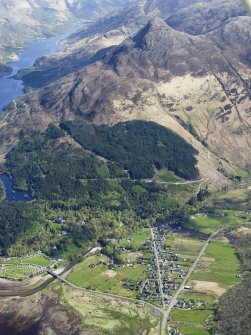 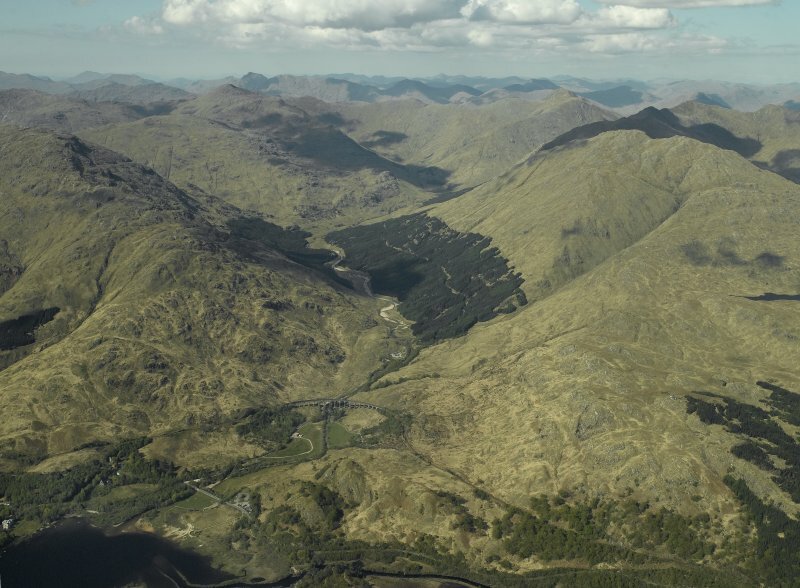 General oblique aerial view of the Pap of Glencoe centred on the village, taken from the WSW. 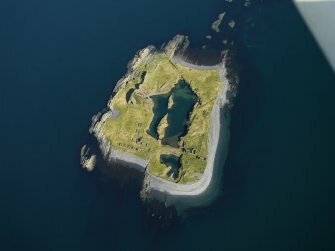 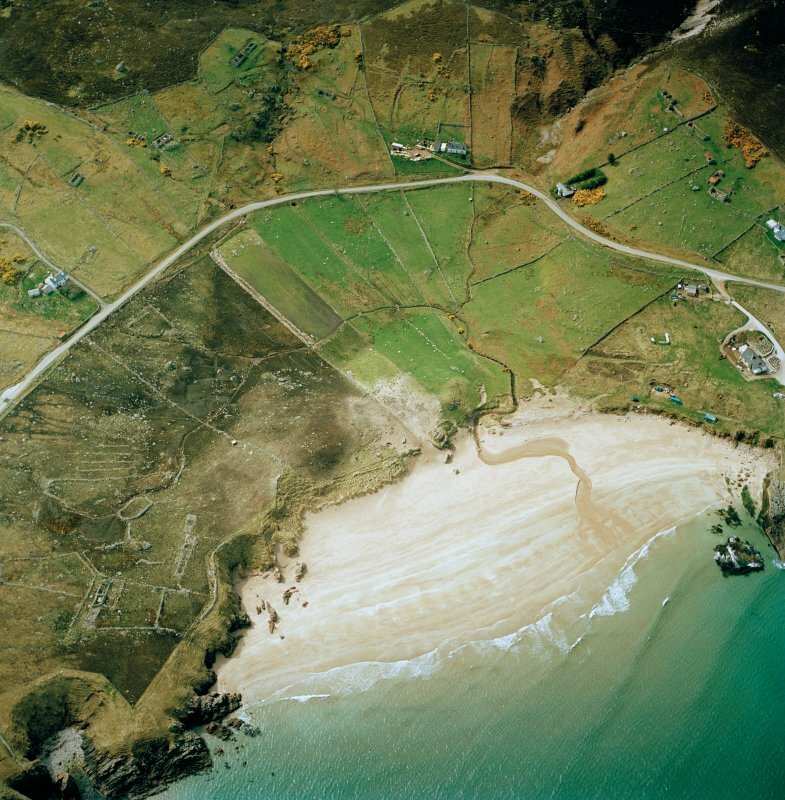 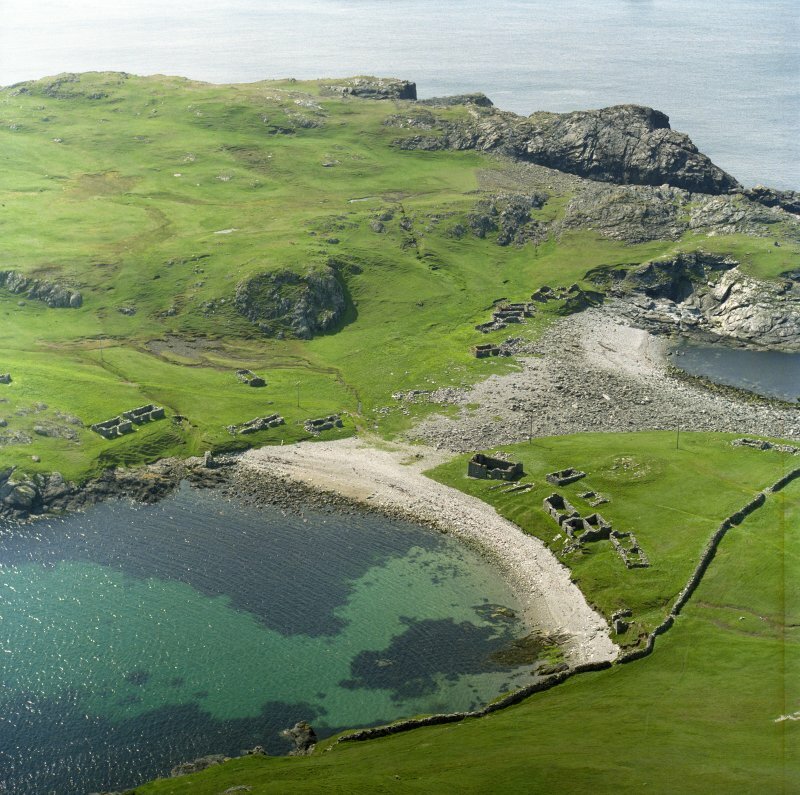 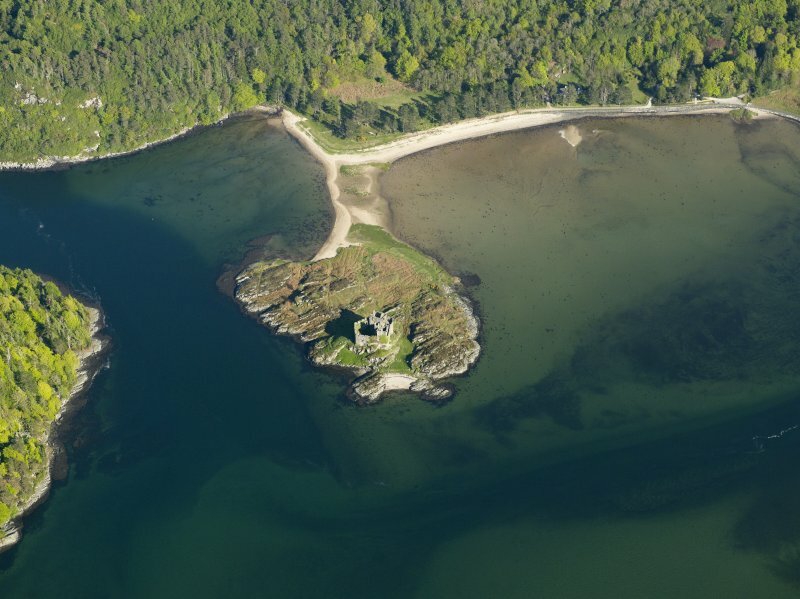 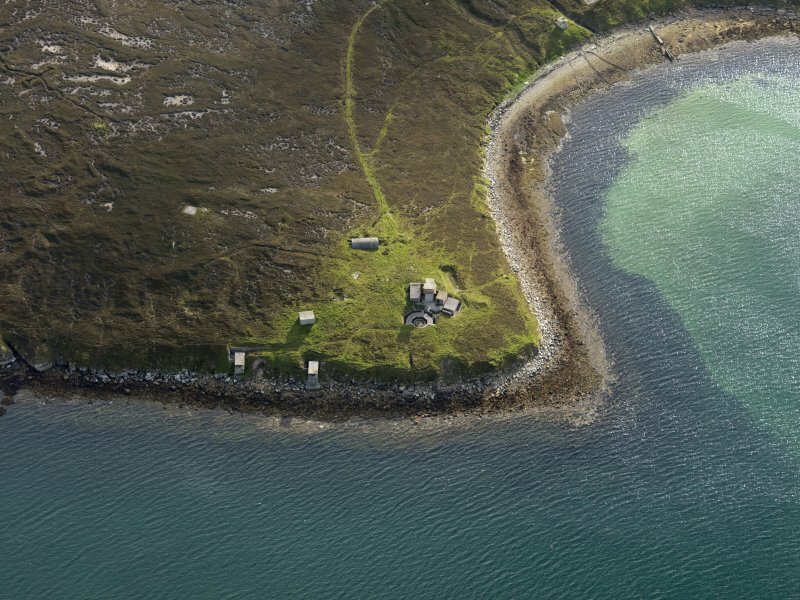 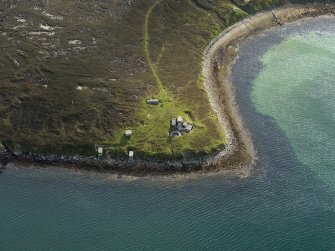 Oblique aerial view centred on the remains of the island dwelling, taken from the E.
Aerial view of A899 Road. General oblique aerial view centred on the dams, power station and reservoir, taken from the WNW. 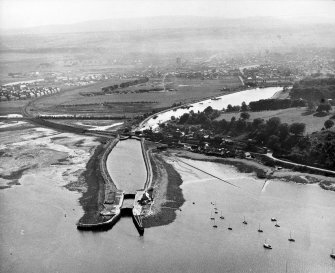 Oblique aerial view centred on the railway viaduct and tunnel, taken from the E.
Oblique aerial view centred on the town and station with the harbour adjacent, taken from the NNW. 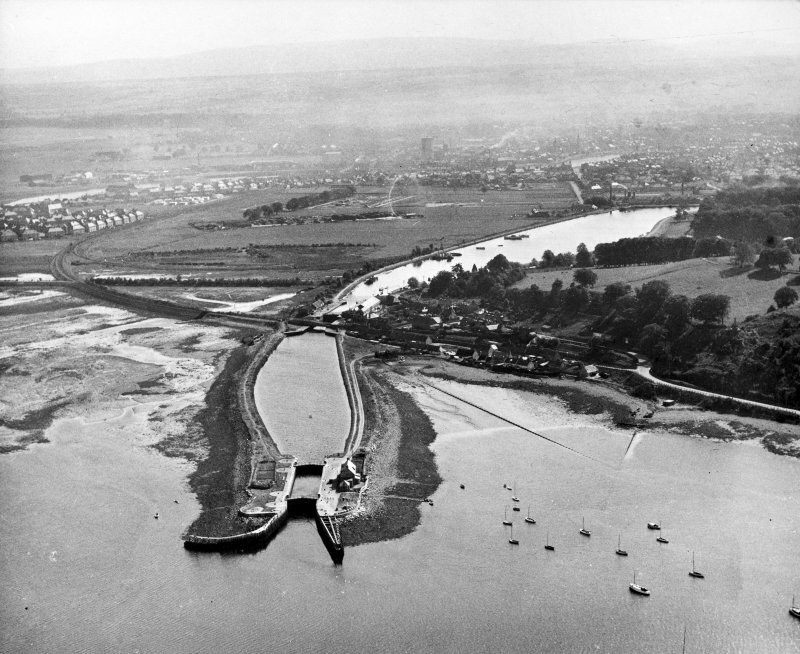 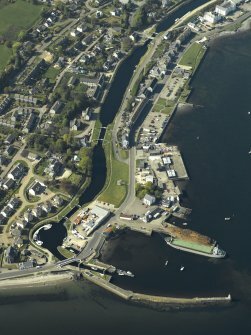 Oblique aerial view centred on the locks, canal basin, pier, harbour, lighthouse, church and buildings, taken from the S.
Oblique aerial view of part of the wood, taken from the SE. 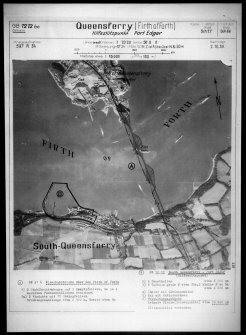 general oblique aerial view centred on the harbour, taken from the NW. 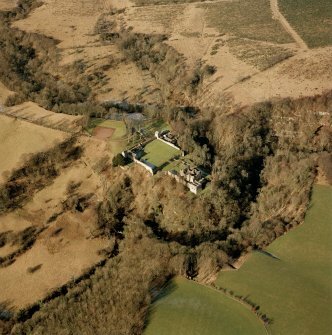 Oblique aerial view centred on the Abbey, taken from the SW.
General oblique aerial view centred on the New Town, taken from the SW.
Oblique aerial view centred on the open cast mine, taken from the NE. 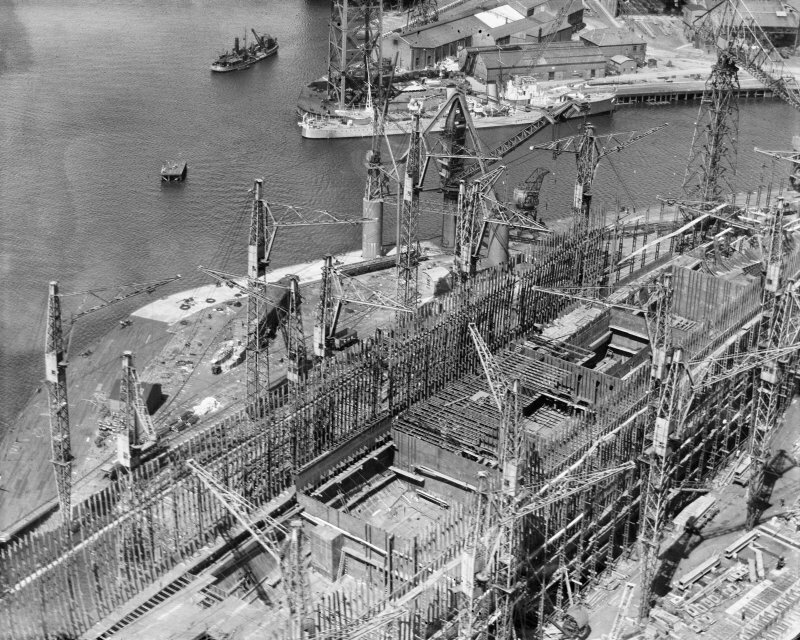 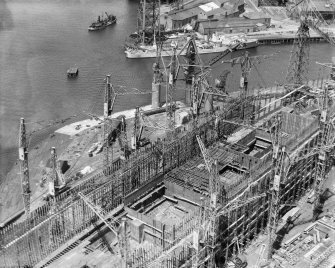 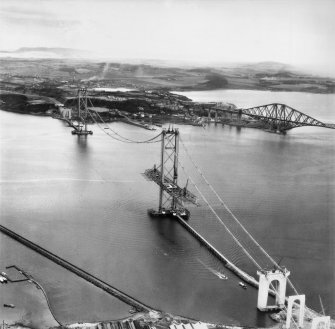 Forth Road Bridge under construction, oblique aerial view. 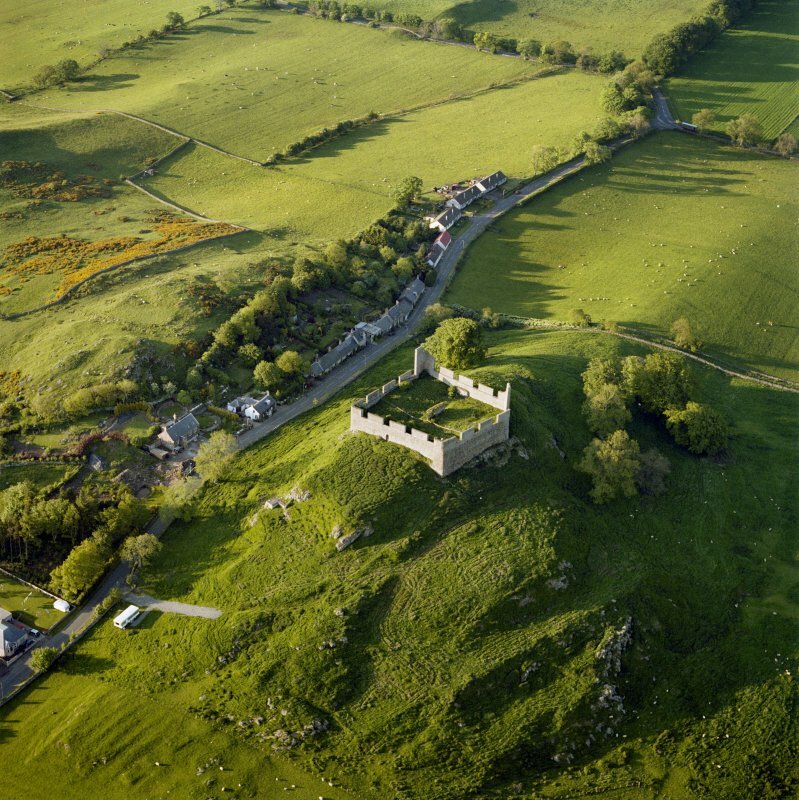 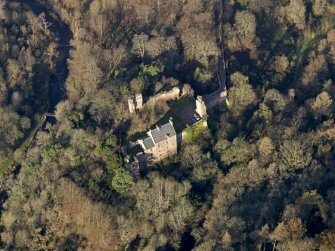 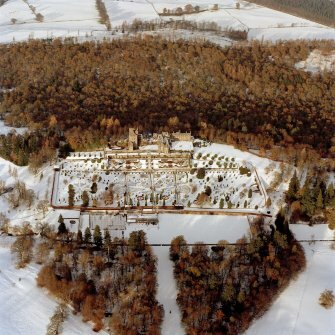 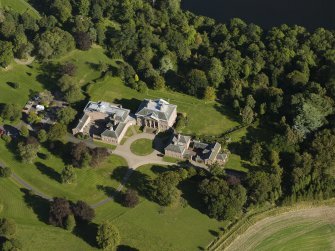 Craignethan Castle, oblique aerial view, taken from the SE. 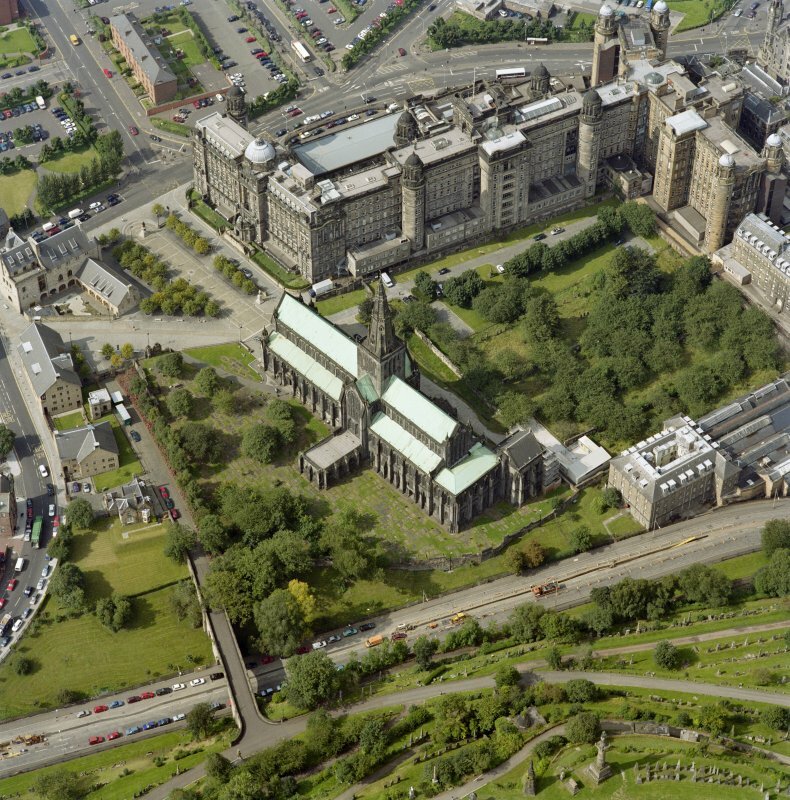 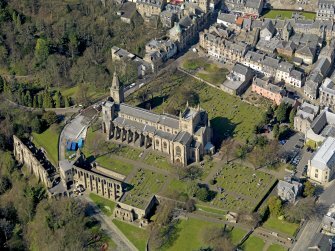 Oblique aerial view centred on Dunfermline Abbey with the Abbey Precinct adjacent, taken from the SSE. 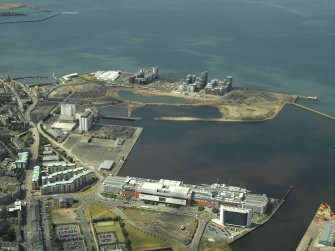 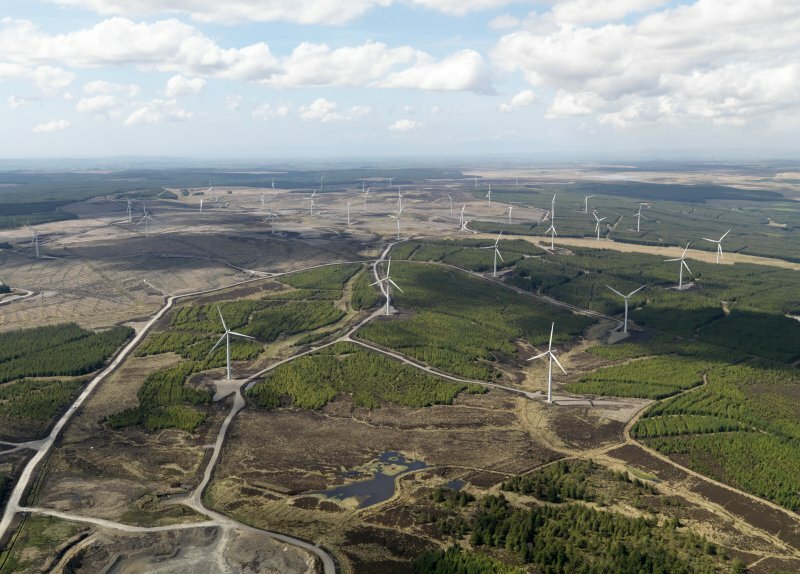 General oblique aerial view centred on the windfarm, taken from the W.
Oblique aerial view centred on the football stadium, taken from the NE. 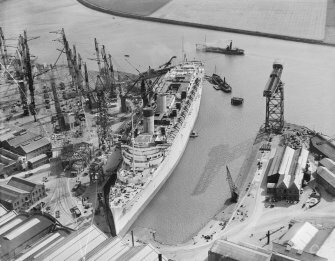 Inverkeithing, Thomas Ward and Sons Shipbreaking Yard, with HMS Nelson, HMS Royal Sovereign and the remains of HMS Rodney adjacent. 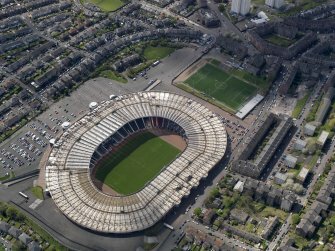 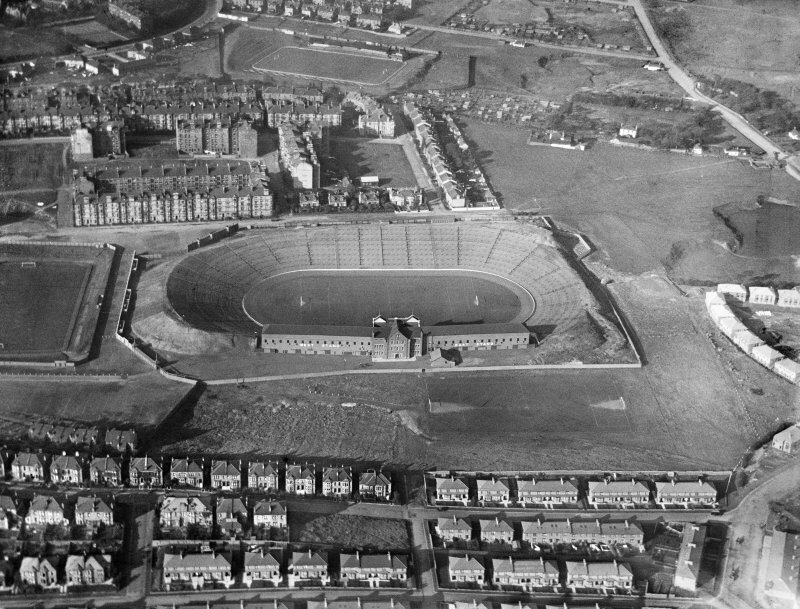 Oblique aerial view taken from the W.
Glasgow, Hampden Park Stadium, oblique aerial view. 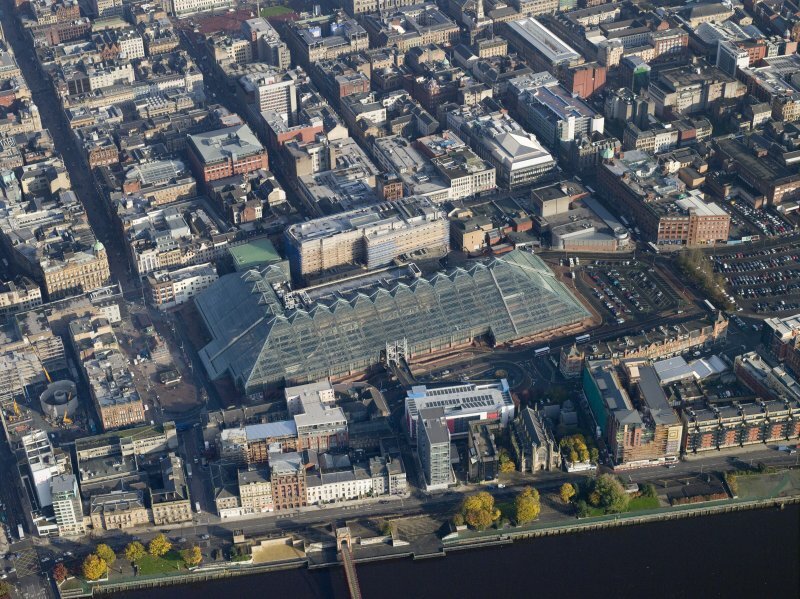 Glasgow, MacFarlane Lang & Co Victoria biscuit works, oblique aerial view, taken from the NW. 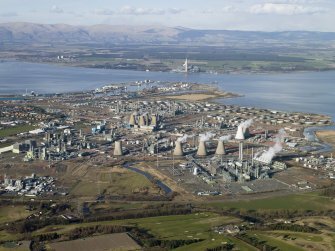 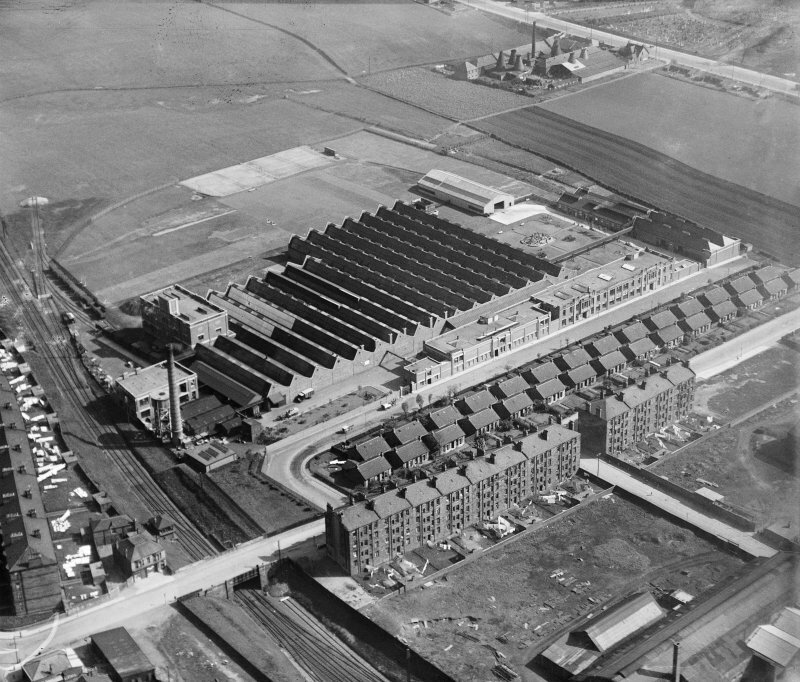 Ravenscraig, powerstation, oblique aerial view. 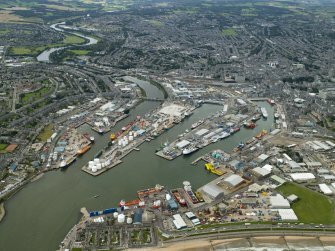 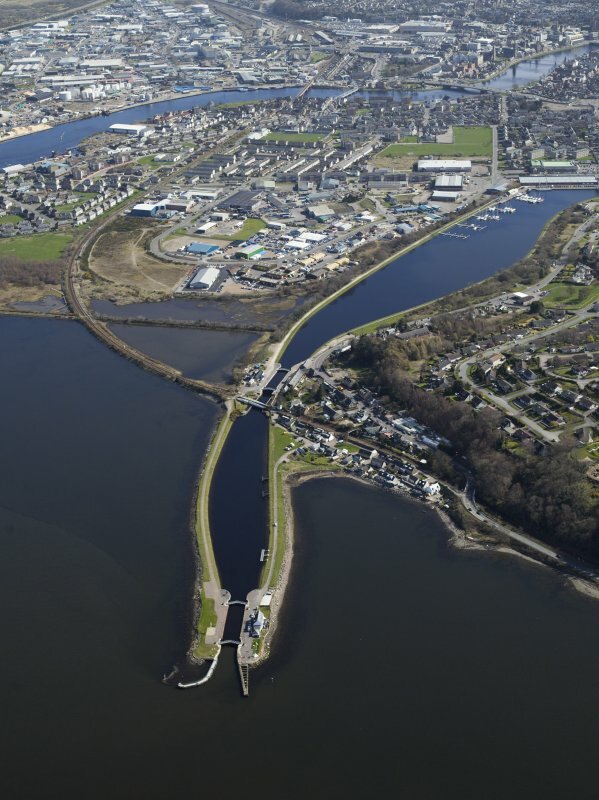 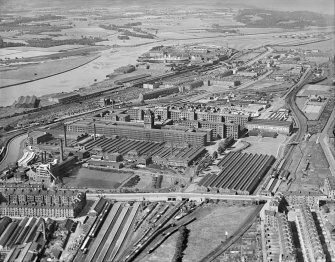 Glasgow, Clydebank, oblique aerial view centred on part of John Brown's shipyard with Clydebank Riverside Station adjacent, taken from the NW. 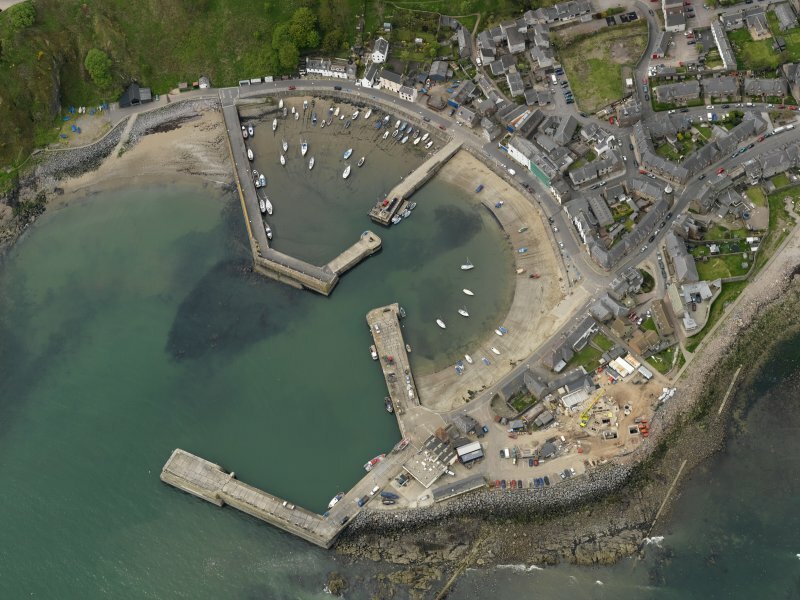 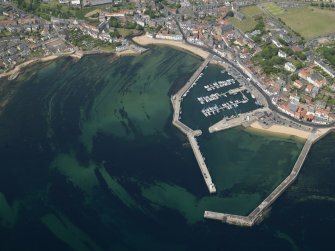 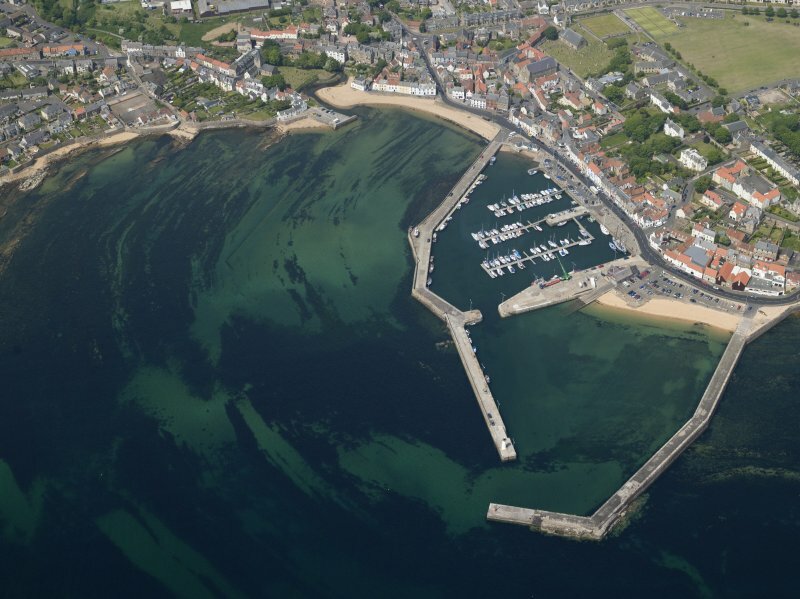 Oblique aerial view centred on the harbour with the Shorehead adjacent, taken from the NE. 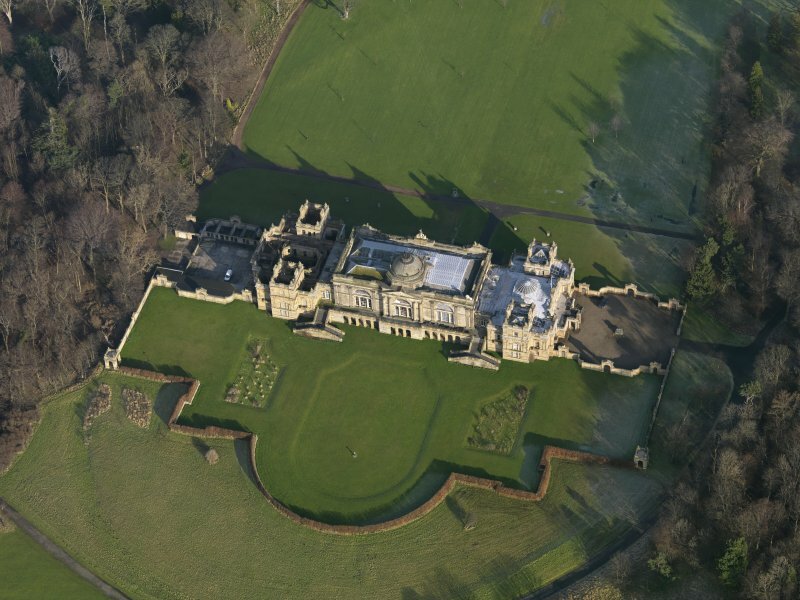 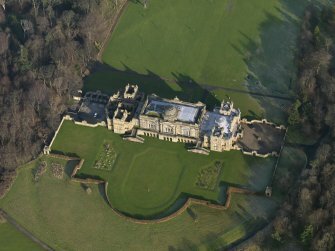 Oblique aerial view centred on the house with the gardens adjacent, taken from the SSW. 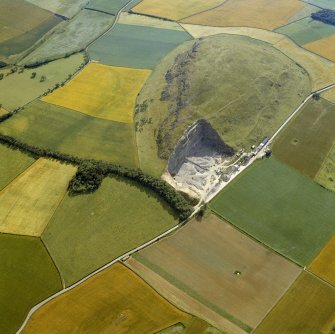 Oblique aerial view centred on the remains of the spoil tip, taken from the N.
Oblique aerial view centred on the remains of the motte, taken from the ENE. 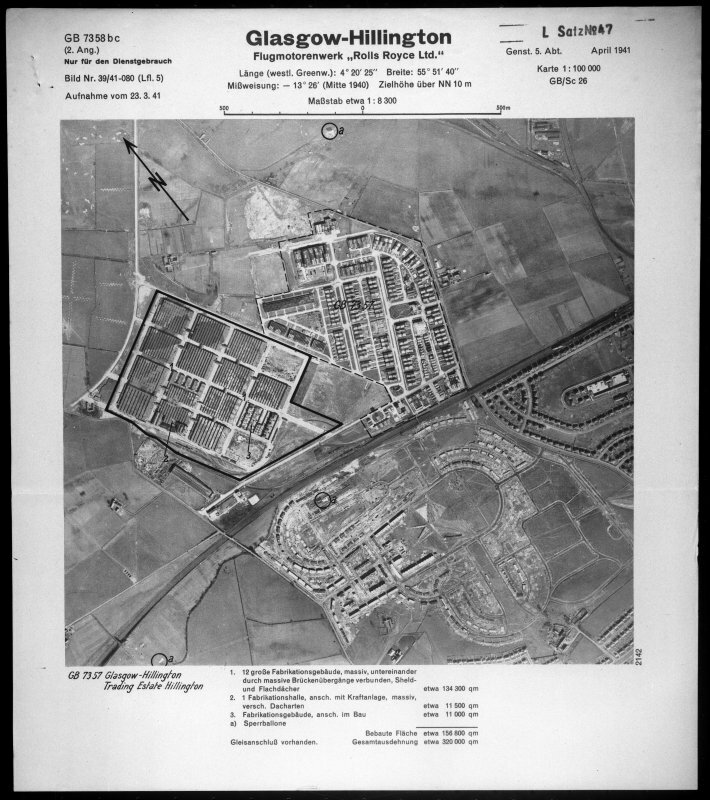 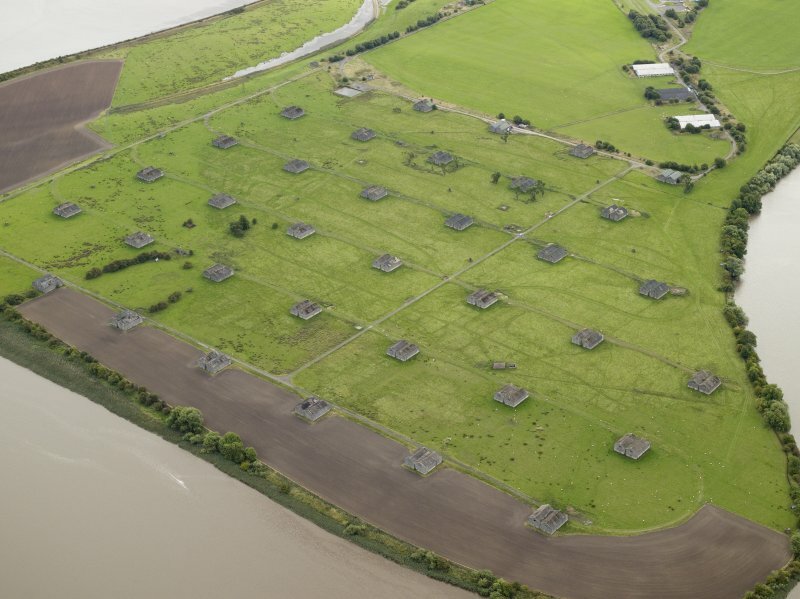 General oblique aerial view centred on Unit 1 of the explosives factory, taken from the ENE. Oblique aerial view centred on the coastal gun battery, taken from the E.
Oblique aerial view centred on the remains of the township, taken from the NE. 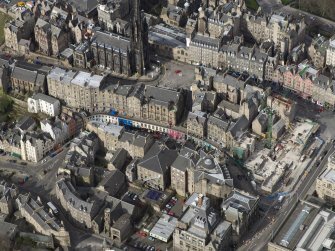 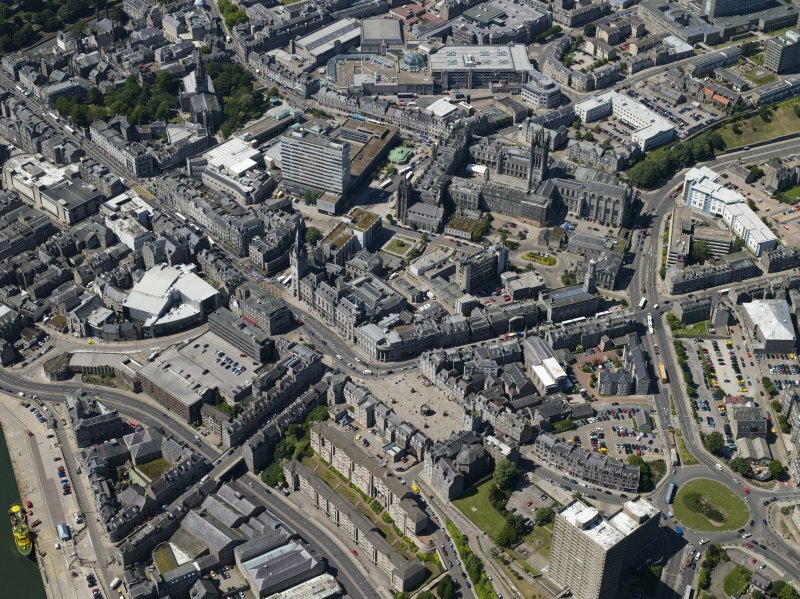 Oblique aerial view centred on junction of High Street, Castlegate, Canongate and Exchange Street from NNE. 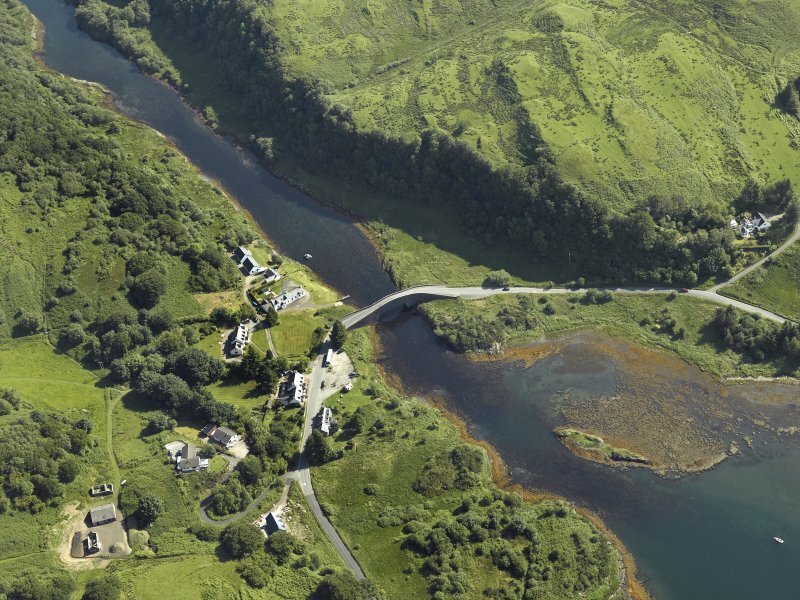 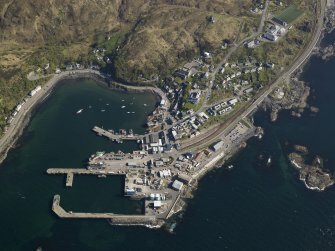 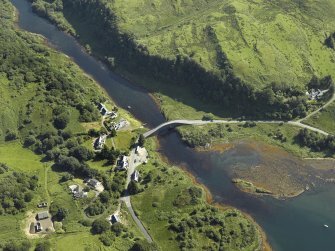 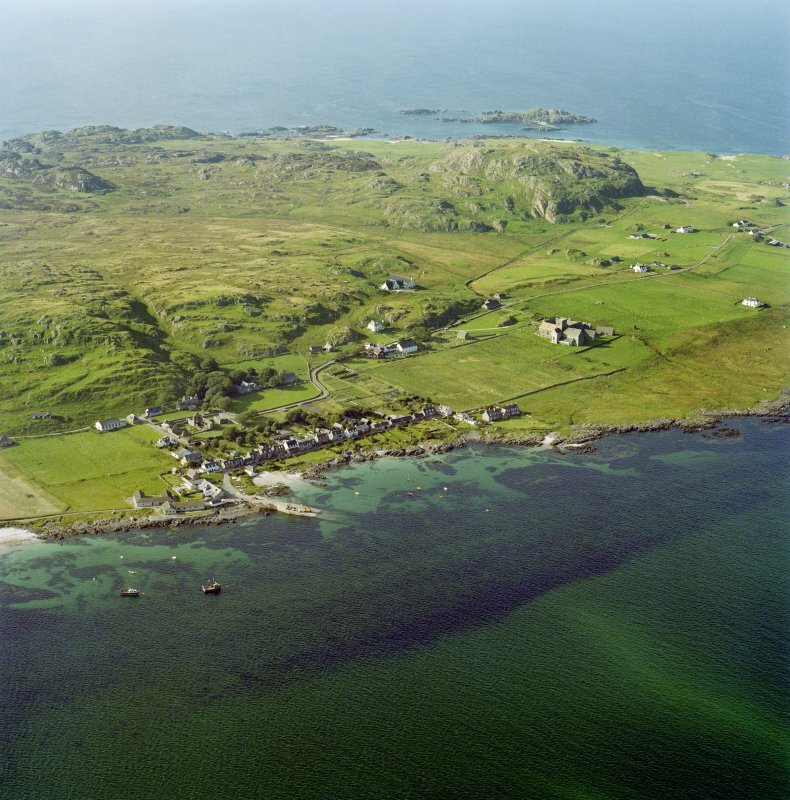 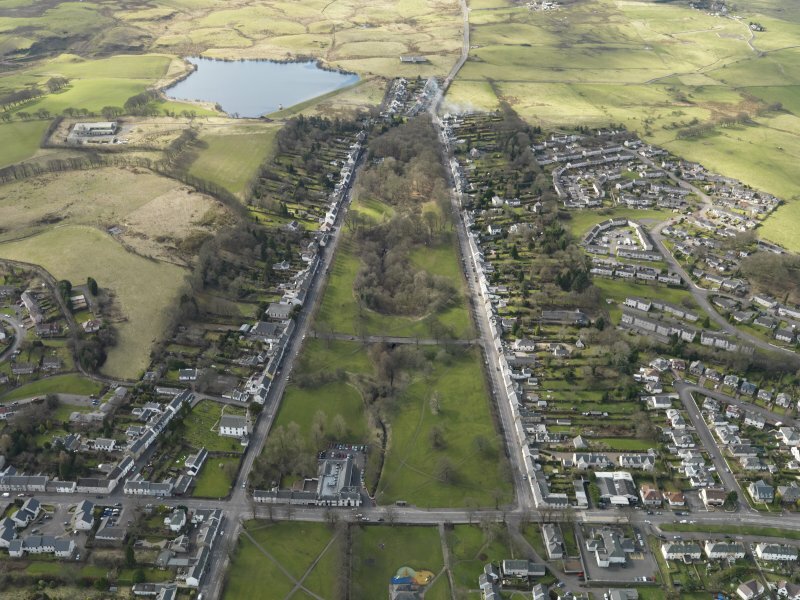 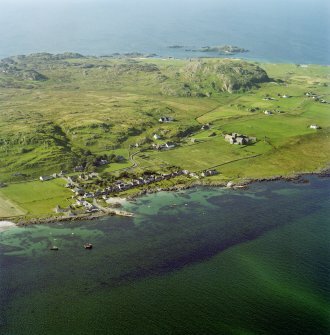 Oblique aerial view showing Clachnahary. 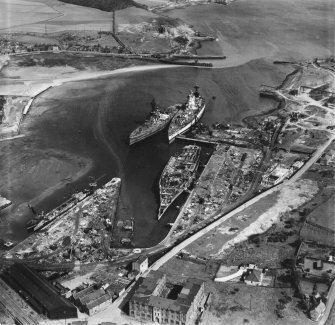 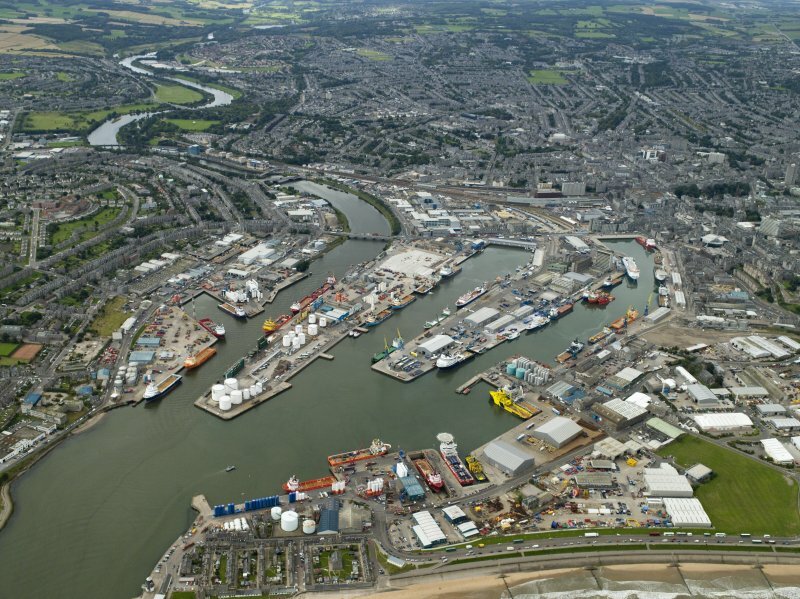 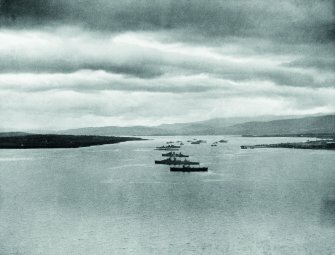 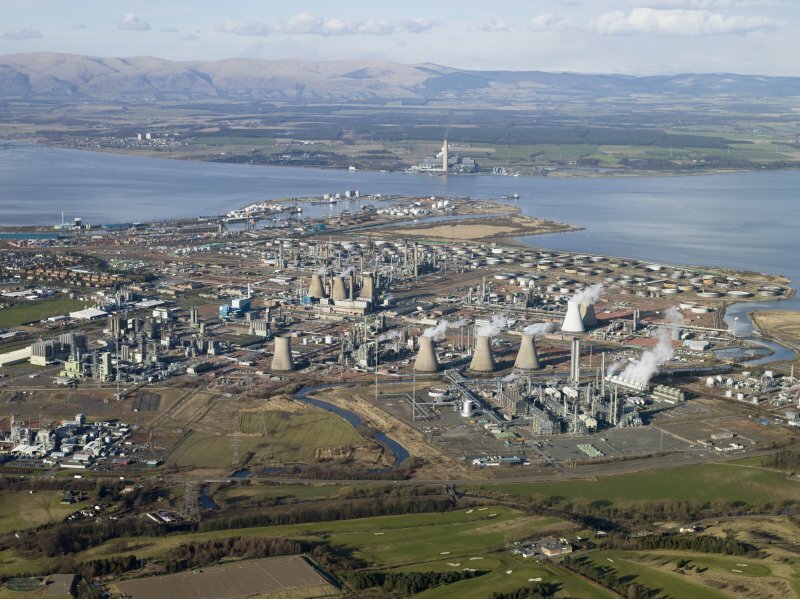 Oblique aerial view of ships off Invergordon. 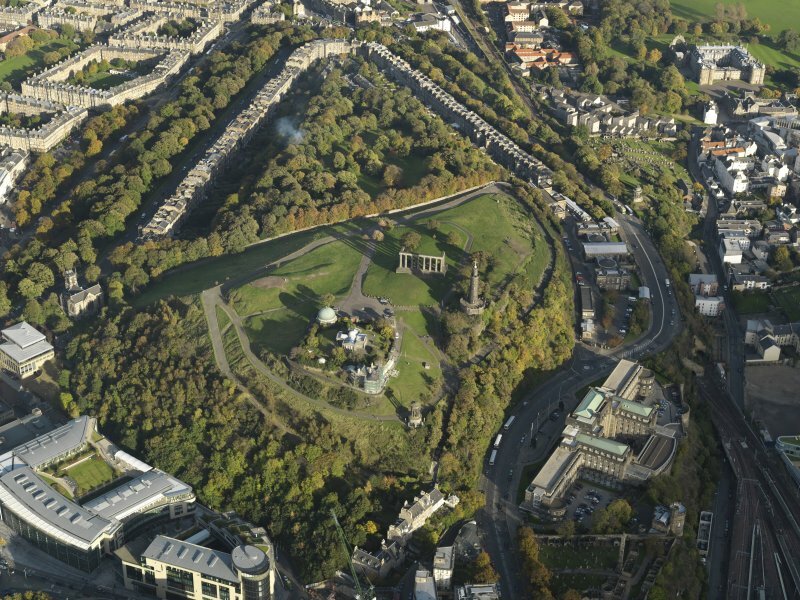 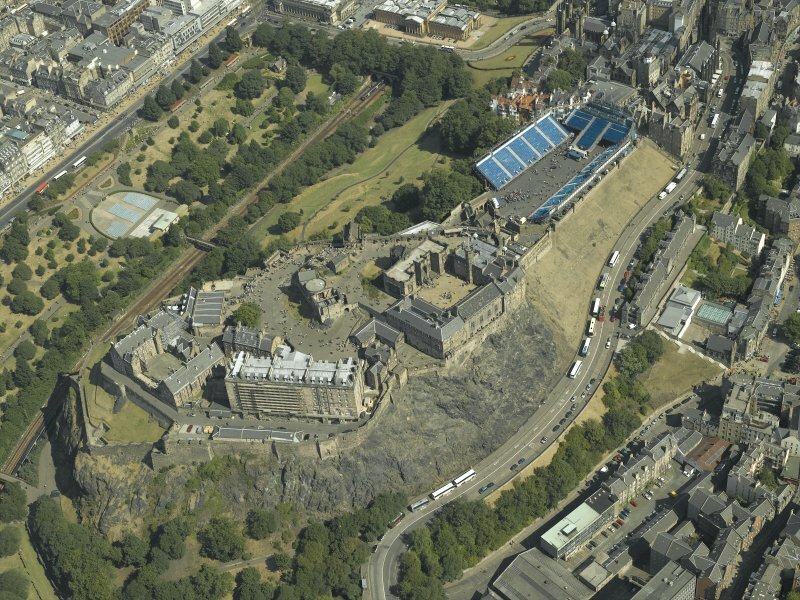 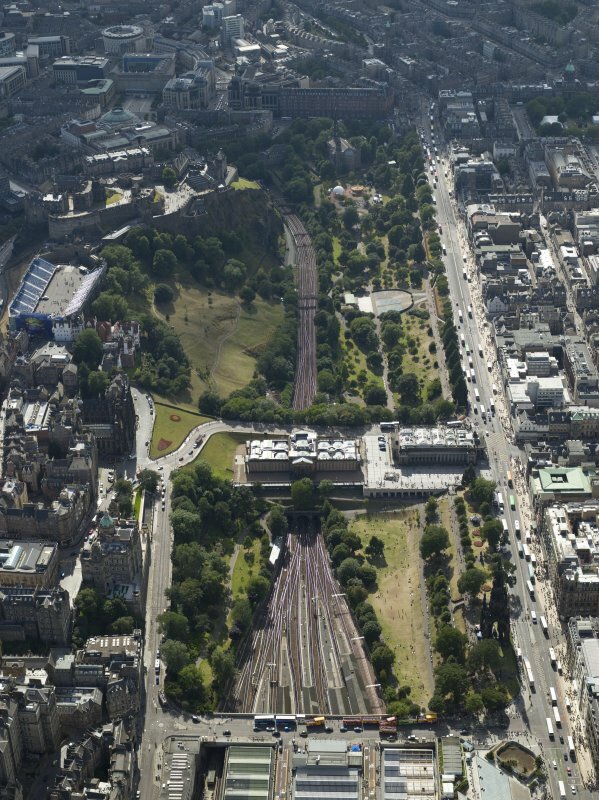 Oblique aerial view of Edinburgh Castle looking south east. 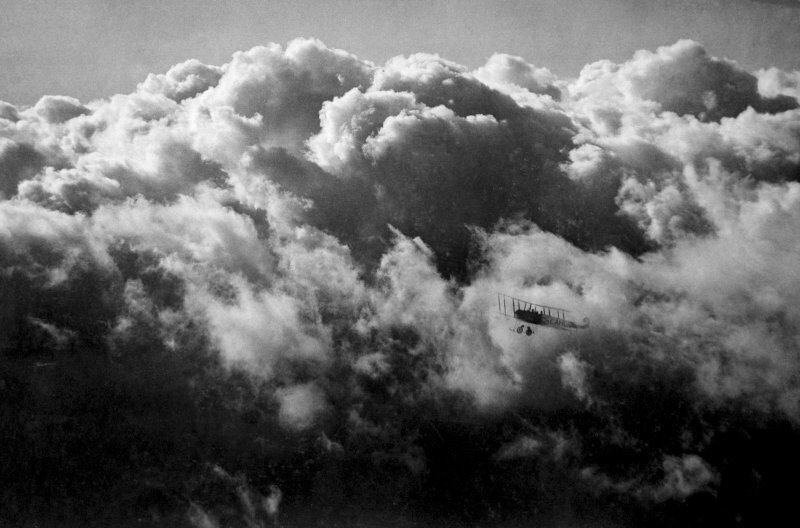 View of aeroplane flying through clouds. Oblique aerial view of Deer Sound, the Point of Od, Mirkady Point and Scarf Point with the fishing station in the top right, taken from the SSE. 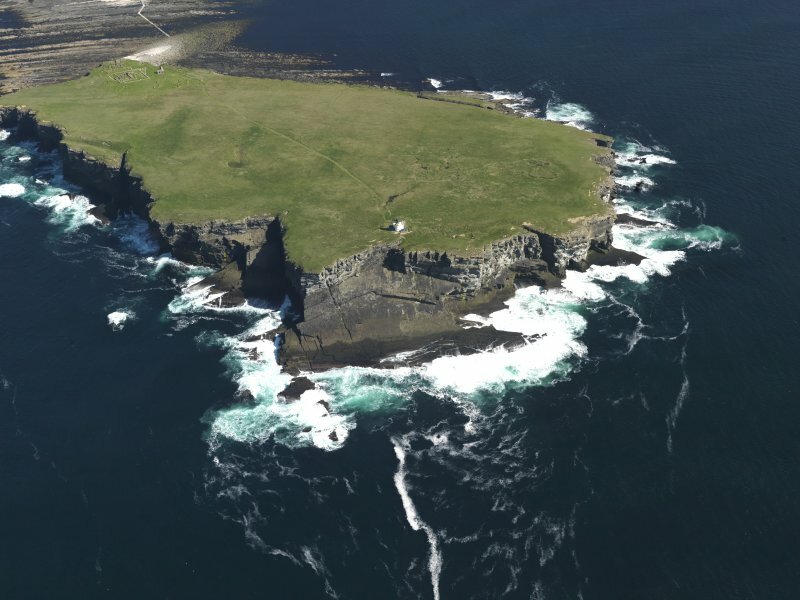 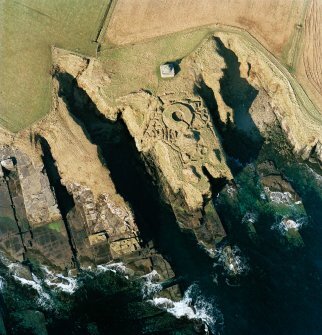 General oblique aerial view of the Brough of Birsay centred on the lighthouse, with the chapel and settlement in the distance, taken from the NW. 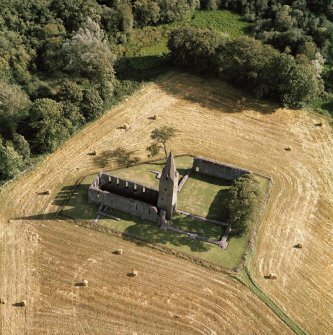 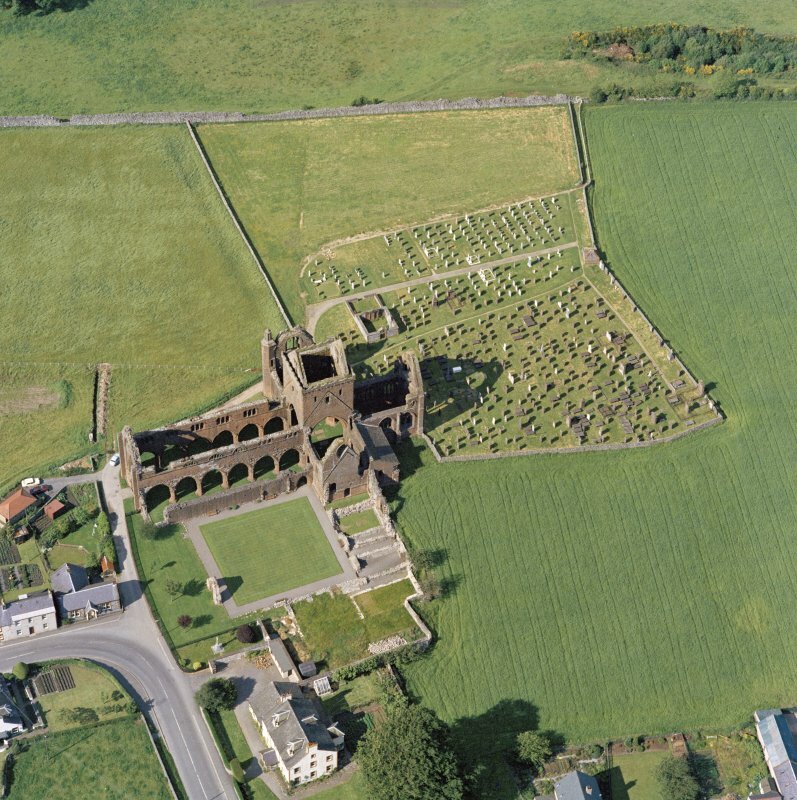 Oblique aerial view of Restenneth Priory. 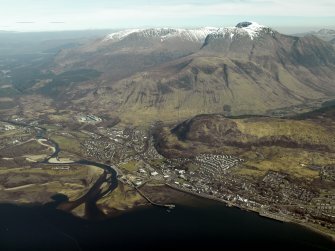 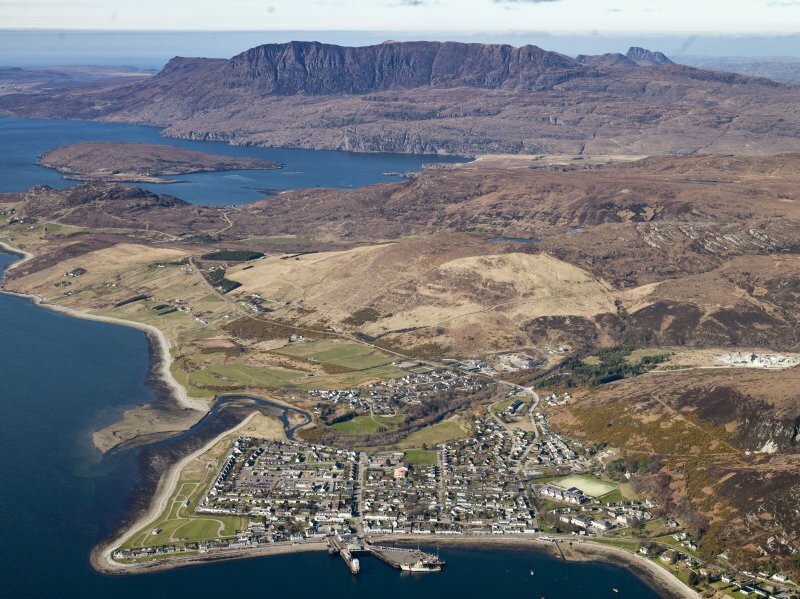 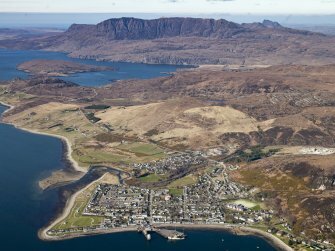 General oblique aerial view centred on the town with Ben More Coigach in the distance, taken from the SE.